NOTE: Due to high order volume, it may take some time for production and shipments to catch up. Order backlog could be up to 6 weeks. Standard vs. Ultimate blocks, what's that all about? What color are the blocks? Standard vs. Heavy Duty hardware, what's that all about? What about manual transmissions and transfer case shifters? What if there is no bushing kit available for my vehicle? What about wheel well liners or Gap Guards? NOTE: If you e-mail 4Crawler Offroad a question, PLEASE be sure you include a proper and working e-mail address to reply to. We get several e-mailed questions a week with invalid return addresses. We try to answer all e-mail questions in 24-48 hours, if you've sent a question and have not received a reply in that time, feel free to e-mail again (with a valid e-mail address to reply to). Also, if you utilize a Spam blocker, please be sure to allow a reply from the e-mail address "r.c.brown@ieee.org". Please consult the Frequently Asked Questions section prior to e-mailing a question and if you want to get an idea on kit pricing, see the pricing tables here. Your answer may already be there! When many folks want to do a "mild" 1" body lift, and there was nothing commercially available. Also, there are countless horror stories of improperly designed body lifts failing, such as drilling holes in hockey pucks, etc. It was apparent from the supplied components that it is doubtful anyone ever tried to actually install these kits on the target vehicle; bolts that are too long or too short, generic instructions, and general poor quality materials. Finally, there are a number of "orphan" vehicles for which there is little or no aftermarket support for due to low demand. If it has body-on-frame construction, it should be possible to make a body lift kit for it! 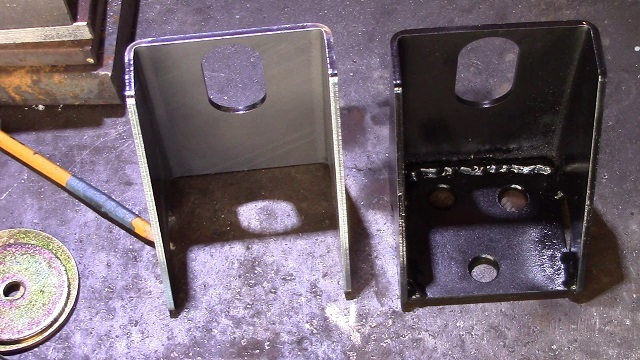 When it came time to upgrade a home-made 1" body lift, 4Crawler Offroad researched available materials and first decided to make a billet aluminum body lift block, similar in shape and size to the more common cast aluminum (at least that's what they claim they are made of) blocks, but out of stronger, solid material. The aluminum blocks were fine for a 1" lift, but a set of 3" tall blocks were made and installed, it just didn't look right. The 2" dia aluminum rod used was just not wide enough to offer support at 3" tall. While a larger diameter aluminum rod could have been used, it starts to get much more expensive and is harder to work. After searching for a better material, Ultra High Molecular Weight (UHMW) polyethylene rod was selected and is available in a variety of sizes perfect body lift blocks. It has all the desirable properties one would want in a body lift block. Since this rod comes in long lengths, it can be cut any length desired from 1/2" up to 3" and anything in between. It takes a fairly significant investment in machinery and tooling to work this material. Also, since the parts are built to order, adapting them to other vehicles is not a large issue. After all, lifting a Toyota 4Runner 1" is fundamentally no different than lifting a Landcruiser or other vehicle 1". If it's got a body on frame construction and some way to get a spacer between the two, you've got a body lift. Usually, installing larger tires (#1) require that either #2 or #3 be done to provide adequate clearance for the tires within the wheel wells. Suspension lifts (#2) can be simple or complex, depending on what is modified and how it is done. Similarly, body lifts (#3) can be simple or complex, but are generally simpler and less complex and expensive than suspension modifications. Since the body lift only raises the body, it has less adverse impact on the vehicles center of gravity than other lift techniques, since the frame, engine and drive train remain at the original location. Taller tires will raise nearly 100% of the vehicle's mass higher at the rate of 1" for every 2" of increase in tire diameter, since essentially every part of the vehicle is raised. Thus a 2" taller tire (i.e. 1" of lift) will raise the vehicle's center of gravity 1". A suspension lift will raise about 90% of the vehicle's mass (all but the ~10% unsprung weight of the axles, wheel and tires) at a rate of 1" for every 1" of lift. Since 90% of the mass is being raised 1", the center of gravity will raise about 0.9" as a result. A body lift will raise only 25% of the mass of the vehicle (i.e. only the body) so a 1" body lift will only change the center of gravity of the vehicle by that same ratio, or 0.25". So, while all the above lifts will raise the center of gravity of the vehicle, they do so at different rates for the same amount of lift. And it is the overall impact of all the lift that a given vehicle has that will ultimately affect it's stability. By raising the body up off the frame, you can gain needed room for larger tires and/or added ground clearance to protect the body from trail damage. However, a body lift will do nothing to change the operation of your suspension by itself. However, by combining a mild body lift, with a mild suspension lift may allow fitting a taller tire and result in a combined system that functions better than the individual components. "Lift as much as needed, but as little as possible"
Each type of lift has its advantage and disadvantages. After all if there were just one perfect way to lift a vehicle, everyone would use that technique and you would have no other choices. Taller tires increase ground clearance under every part of the vehicle and work better off road as they give more traction and are able to tackle bigger obstacles. On the downside, taller tires often require regearing to make up for the lost torque due to the greater tire diameter. Likewise a taller tire needs more room to fit under the vehicle without rubbing. So you can either trim the body away to fit the tire or somehow lift the body away from the tires to make room for them. One way to make room between the body and tires is to raise the suspension. A suspension lift may offer better performance off road if it is capable of increased wheel travel and articulation. However, this is not always the case since some suspension lifts use stiffer, less flexible springs or blocks or drop brackets that do little to improve suspension capability, aside from the lift. On the down side, suspension lifts test to be expensive and the taller the lift the more the cost, since more issues arise that need to be addressed. Along with the lift, you may need longer shocks, longer brake lines, longer drive shafts, etc. Suspension geometry may be negatively impacted. And on some vehicles, there is an upper limit to high high a lift can be done. Also, suspension lifts may be advertised as X", but you may see more or less lift than advertised. This leads to the 3rd lift option of a body lift. Body lifts tend to be less expensive than suspension lifts. They are also more predictable in terms of lift height. After all you are placing a known thickness block between the frame and body and you will see exactly the amount of lift that the block is tall. So this makes a good alternative to getting that little extra lift you may find you need after installing a suspension lift, for example. A body lift will not affect drive shaft, shock absorber, or brake hose lengths. It will also not impact suspension or steering geometry. A body lift is a passive form of lift, in that it will not do anything to make your suspension work any better off road, aside from giving more room for the tires to move around under the body without making contact. Also there will be no increase in under vehicle ground clearance (a.k.a. break over angle), unless you also raise the drive train and other low hanging components up to match the lift. However, if bumpers are raised to match the body lift, you may see increase approach and departure angles. What constitutes a "mild" body lift? So, 1" isn't all that much, is it even worth doing? What about taller body lifts? Why might I need a body lift at all? I've got an XYZ vehicle, do you make a lift kit for it? What if I have a flatbed on my pickup and only need to lift the cab, do I have to buy a "full kit"? What is included in the body lift kit? How long will it take to get the kit? Can I return lift kit components I don't use? How large a tire can I fit with X" of lift? What if I already have a body lift and want to remove it, reduce it's height or adapt it to another vehicle? I'm looking for an "RB" or "Roger Brown" body lift kit, where do I find that? What are bed spacers and do I need them? I already have a suspension lift and have some tire rubbing, can I add a body lift on top of the suspension lift? Is 4Crawler Offroad still in business and making body lift kits? Have a question not listed above, send an e-mail and we'll try to answer it. 1. What constitutes a "mild" body lift? In our definition, this is any body lift you can install before encountering major modifications. With the stock Toyota design, there are two likely "mild" lift points, one at about 1/2" and another at 1". At 1/2", you may be able to re-use the stock fasteners, taking advantage of the excess bolt length, to get a little bit of lift. This assumes you have at least 1/2" of exposed bolt length past all the body mount nuts, check to be sure, this varies by year and body style. If needed, 1/2" longer than stock hardware can be supplied. Useful for installing rock sliders - exposes a bit more frame for stronger attachment. At 1", you'll need to replace the stock fasteners and possibly make minor modifications to a few other parts. Beyond 1", you'll start to have issues with more components like shift and steering linkages, gas tank filler hoses and other frame-body inter-connections, but on some vehicles, 1.5" or 2" lift is still pretty easy to do. An automatic transmission has more complex linkages than a manual transmission. Most Toyota automatic transmission linkages can accommodate a 1" body lift without adjustment and there is a bolt-on bracket for 2" and 3" body lifts on 1st and 2nd gen 4Runner and pickup. The 3rd gen 4Runner and Tacoma A/T linkage is fully adjustable, so no bracket is needed up to a 3" lift. For the newer model Toyota vehicles with rack and pinion steering (like '96 and newer 4Runners, Tacomas, etc.) anything over a 1/2" body lift will likely require modification of the steering shaft. A bolt-on steering shaft extension is available. 2. So, 1" isn't all that much, is it even worth doing? One way to look at that, is that using a 2" taller tire (say going from 31" to 33") will raise your vehicle 1", granted all points of the vehicle will go up 1", including the body, but an inch is an inch. From a simple-minded perspective, using a 2" taller tire, will require 1" additional wheel well clearance (may need more) and a 1" body lift can provide that 1". Toyota trucks have fairly long front and rear overhangs, anything you can do to raise the ends of the vehicle will increase your approach and departure angles. If you are planning to install body protection like nerf bars and bumpers, then raising the body up and tucking the protection in underneath will give you the protection and preserve the clearance angles. Certain aftermarket bumpers are not possible to raise without major modifications. For example, the ARB pickup bumper is mounted in such a way as to make lifting it difficult. However, it is possible to leave it attached in the stock location. On vehicles with independent front suspensions, lift options are limited, so every little bit can help. 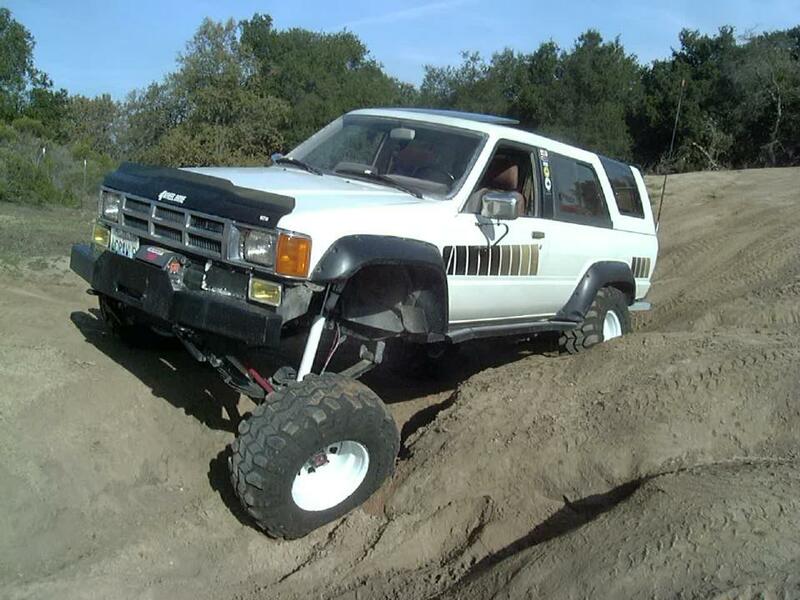 This '93 4Runner ran 33x12.50 tires with a 1" body lift. For leaf springs, more arch in the spring, often implies a stiffer spring rate as well. For example if 4" of lift is needed for a given tire size, then a 3" spring and 1" body lift may give a better result than a stiffer 4" spring by itself. By spreading the lift over different components, the impact on any one component is lessened. For example a 4" spring lift may require drive shaft modifications, while a 3" lift may not. Its all a matter of degree and cost vs. benefit. A 1" body lift can make accessing parts on the engine like filters and the starter *so* much easier, this is an often overlooked side benefit of a body lift. Also, certain engine modifications like V6 headers, engine or transmission swaps require some body lift to be installed at all. An example is the popular 3.4L V6 engine swap in the earlier Toyota pickups and 4Runners. That generally requires a 1" - 2" body lit to fit the taller intake under the hood. Without a body lift, a hole must be cut into the hood to let the intake components fit. Removing and installing the transmission can also be easier since you have access to to the upper mounting bolts. Finally, you may find in certain states and/or countries, only a certain amount of lift is allowed on a given vehicle in order to pass inspection. While you might like to lift the rig 3", it'll only be legal at a 1" lift. Be sure to check your local vehicle regulations prior to installing any lift. 3. What about taller body lifts? As you raise the body higher off the frame, you may run into more issues that need to be addressed. It is difficult to give a precise list of what issue will be encountered at an exact lift height, because there are some many variations in vehicles, when they were built, how they were built, etc. Some folks can thrown on a 2" body lift and have no issues at all. Others may run into issues at a 1" lift. Basically you can think of the relationship of lift height vs. potential issues you might encounter as a probability; the higher you lift the more likely you are to run into a particular issue. So, as mentioned elsewhere on this page; "Lift as much as needed, but as little as possible." Best to consult the installation notes for your specific make/model/year vehicle to see what sort of issues that you may encounter. While a 1" body lift is considered mild, there are many folks running 2" and 3" body lifts. 3" is pretty much the maximum lift you should consider on the stock mounts. Above this and you should consider raising the mounting bracket on the frame to reduce the leverage caused by the taller blocks. At 2" on most Toyotas, you will find that in addition to the items that a 1" lift affects, you may need to extend the hydraulic line to the clutch slave cylinder and at 3" you'll likely need to extend it. A stock front brake line works well for this. At 1" the radiator shroud was probably OK as-is, but at 2", you should drop the radiator to re-center it on the fan. Same story on the shift levers, while modifications are optional at 1", they will probably need to be done at 2" and for sure at 3"
You'll also need to let the steering shaft lengthen a bit and chances are the upper engine ground strap may need to be lengthened. With a 1st gen. 4Runner, a 2" lift allows you to raise the gas tank 2" using the existing pickup mounting holes on the cross member. At 3", in addition to the above items need attention as well as dealing with fuel lines at the gas tank. One option at the 3" stage is to also lift the entire drive train by a similar amount. For example, the engine and transmission could be raised for additional break-over angle, the fuel tank could be raised, etc. This will restore many of the interference areas to their original position. This is what I chose to do on my 4Runner and you can find out more on that project here. Above 3" and you are asking for trouble and 4Crawler Offroad won't provide any components for that application. Best bet above 3" is to fabricate new body mount brackets raised up the desired amount and attach the body to the raised brackets without any lift blocks. 4. Why might I need a body lift at all? Lets assume you have installed a suspension lift in order to run larger tires. On level ground, you'll have lots of clearance between the tire and body. But, if your suspension has a decent amount of flex to it, when you bottom out the springs on the bump stops, what happens to the larger tire? Well, its now trying to fit into the same wheel well opening that was designed for the stock size tire and you may experience interference. 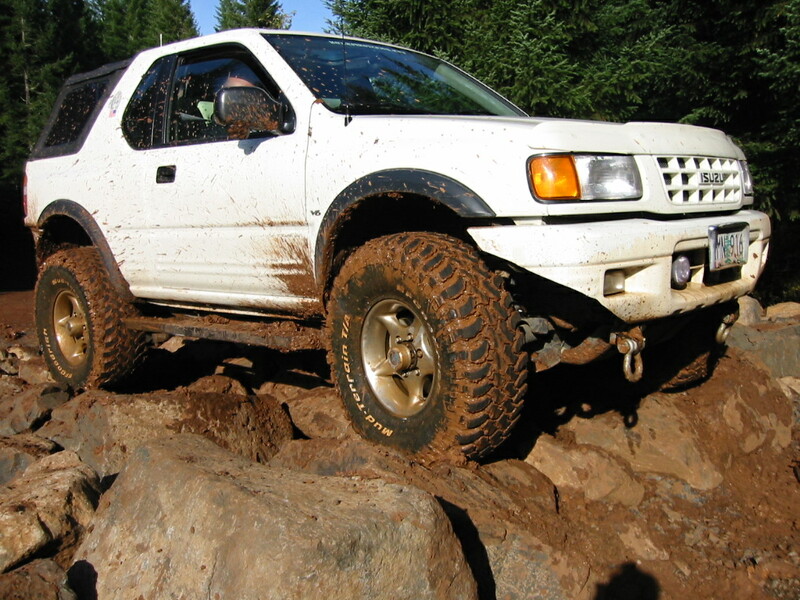 So, by lifting the body up off the frame, you can gain clearance for larger tires to fit in off-road conditions. Other options are to trim the sheet metal around the wheel wells or run springs that are so stiff that they won't compress to the frame. Many people prefer a soft flexible spring with just enough lift to fit the tires, then a body lift to gain the clearance needed for off-road use. Body lifts are also commonly used with engine swaps and modifications like installing exhaust headers, etc. Lifting the body off the frame a bit gives a bit more room for larger engines, exhaust tubing or other components to fit. You may also find the increased clearance helps in routine maintenance tasks like working on starters, fuel filters, transmissions, etc. 5. I've got an XYZ vehicle, do you make a body lift kit for it? XYZ is not any specific vehicle, replace XYZ with Dodge, Jeep, Ford, Nissan, or whatever vehicle you have and are interested in having a body lift kit designed for. If it is not listed here, then 4Crawler Offroad doesn't have a design available for that application. But, everything listed on this page, outside the early Toyota 4Runner kits, has been designed with the help of people just like you that asked this very question. If you are willing to do the small amount of research needed to help 4Crawler Offroad design and build the kit, chances are the answer will be YES! First, verify that the vehicle uses a body-on-frame construction. Many modern vehicles use a uni-body or uni-frame construction where the body and frame end up being one piece. If there are no body mounts, bushings or bolts visible underneath, then chances are the body can't be raised off the frame with a body lift. Diameters and working lengths for each mounting bolt. Be sure to measure the actual outer diameter of the threaded portion of the bolt. On rare occasions, OEM bolts may have different diameters along the length of the bolt, either a shank (un-threaded part) that is larger or smaller in diameter than the actual threads. Sometimes there is unused thread on bolts, so if you see more than 1/2" of exposed thread beyond any body mount nut, note that information as it'll help size the replacement hardware properly. Bolts commonly come with only 1" of threaded length, but some OEM hardware is custom designed with 2" or more threaded length to account for the excess length, probably because of some automated manufacturing issue. Another way to think about this is if you were to cut the bolt off just past the tightened nut, how long would the remaining bolt be? That is the actual working length of the bolt. If items need relocating like bumpers, radiators, etc., we'll need to know details on how they are mounted to the frame. E.g. 2 - 12mm bolts, 60mm on center horizontally oriented - then we can design a bracket to raise that bumper to match the body lift. Getting this data won't be all that hard, get under your rig and count the body mount locations. Find where all the bolts are, you should be able to loosen and remove one at a time, pull it out, measure it and put it back. Get dimensions, take pictures, and send them to 4Crawler Offroad. Bolt lengths are measured from the bottom of the head to the end of the shaft, DO NOT include the height of the head in the length. Also, some vehicles have, for example a 5" long bolt, but with 1" of thread exposed when installed, so, this should be noted, e.g. 'Bolt 5" long w/ 1" exposed thread'. Bolt diameters are measured at the shaft, its not the size of wrench that fits on the head. If a bolt goes into a captive nut inside the body, then the thread pitch (i.e. SAE, this will be Threads Per Inch, and if metric it'll be in mm/thread) will need to be measured. Don't assume all bolts are the same diameter or length. They are usually the same side to side, but can be vastly different sizes in different locations. And don't just measure down from the underside of the floor or guess, you really need to pull the bolt out, measure the length and best if you can send a photo of all the bolts side by side with a ruler for scale. If should be no problem to remove a body mount bolt, no vehicle support is needed, gravity will keep the body in place, just make sure you put them back before driving it! So you provide 4Crawler Offroad with the specifications, you will get a "custom" kit with no extra charge for the custom design work. 4Crawler Offroad will hope to make up the design cost in additional sales of kits for that application. This also assumes that 4Crawler Offroad is able to source the required hardware and other parts needed for the lift. For example certain sizes of metric hardware is difficult to find in lengths over 120mm long. This was recently done for the Kia Sportage body lift kit. Within a few weeks of the initial contact, a kit had been designed, manufactured, and installed on the owners truck. A similar turnaround was seen for the 3rd and 4th generation Toyota 4Runners, the FJ Cruiser and the various other Landcruiser models..
A 3" body lift is the tallest that is safe and reasonable. Many state/country vehicle codes may have 3" or even lower height limits on body lifts, so be sure to check the regultions in your area before ordering. If planning a body lift over 3", please consider cutting the brackets off the frame and raise them up the desired amount and weld them on with added bracing. The life you save may be your own! 2" (50mm) OD Aluminum (aluminium) blocks run US$10.00/ea. up to 1"/25mm tall. 2" (50mm) OD UHMW blocks are US$5.00/ea. up to 1" (25mm) tall; add US$1.50/inch (25mm - or any fraction thereof) over 1" tall. 2-1/2" (64mm) OD UHMW blocks run US$7.00/ea. up to 1" (25mm) tall; add US$2.00/inch (25mm - or fraction thereof) over 1" tall. 3" (76mm) OD UHMW blocks run US$8.00/ea. up to 1" (25mm) tall; add US$3.00/inch (25mm - or fraction thereof) over 1" tall. 3-1/2" (90mm) OD UHMW blocks run US$10.00/ea. up to 1" (25mm) tall; add US$4.00/inch (25mm - or fraction thereof) over 1" tall. Center holes are drilled by default, unless otherwise specified a hole to accommodate a 3/8" / 10mm bolt will be drilled. If no hole or larger holes desired, specify with order. 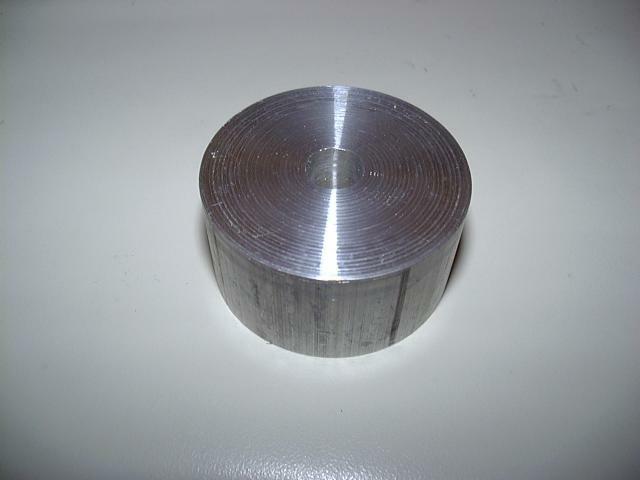 Add US$1.00/block for holes of 1/2" (12.5mm) or larger in diameter. 2" OD UHMW rod priced at $20.00/ft. 2-1/2" OD UHMW rod priced at $33.00/ft. 3" OD OD UWHW rod priced at $38.00/ft. 3-1/2" OD UHMW rod priced at $50.00/ft. 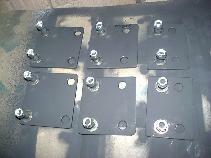 Longer bolts are available, cost varies with length, diameter and grade. 6. What if I have a flatbed on my pickup and only need to lift the cab, do I have to buy a "full kit"? No problem, every kit is built to order. If you only need 6 blocks for the cab, that's what you order. If you've bobbed the bed on your pickup and only have 6 bed mounts instead of 8, that's what you order. If you only want 3/4" or 1.5" instead of 1" or 2", that's what you order. For example, an Ultimate lift kit for a pickup cab (only - bed replaced w/ a frame-mounted flatbed) would include 2-2" and 4-2.5" dia. blocks and 1/2 of a pickup hardware kit, since the flat bed is attached to the frame directly and probably won't be lifted. Contact 4Crawler Offroad for special pricing on these combinations. 7. What is included in the body lift kit? What is included in your kit depends on what you need. See above question for the case of a pickup cab only, no need to purchase the bed hardware. Each "kit" is built to order to meet your needs. See the pricing and options pages here for some common combinations. If the combination you need is not listed, don't worry, it is likely available. Need some help designing your kit? I'm available by e-mail to discuss your particular needs. 8. How much does a body lift kit cost? 9. How long will it take to get the kit? 4Crawler Offroad tries to stock most of the common parts for the various lift kits (nuts, bolts, etc.) Other parts are hand crafted as needed to fill your exact order. Think of the popular fast food place, your hamburger is made to order while you wait, "Have It Your Way". For us, this can take 1 - 2 weeks, depending on backlog (as noted below). So what is a backlog? Well that means the time it will take before we can get to or start working on your kit order. Then once we start working on it, then it'll take the time noted above to finish it. It is hard to be more specific, since every order is unique, including your order and all the orders in the queue before yours that we need to finish first. And since every order is unique, it can take a variable amount of time to finish and when those unique orders are submitted in a random order and all have their own special requirements, trying to predict fabrication times to the day for any given order is impossible. So the above estimates are typical, meaning that some orders may take that amount of time, some a little less and some a little more. Realize that we are not just sitting here waiting for your order to arrive, so there are likely quite a few orders ahead of yours in the queue. It may take less time for simple orders and up to a week more for complex kits. So don't place an order a couple of days before you have time scheduled for a shop to install your kit. And while it would be nice if we had a huge warehouse full of every single component we make that we could just pick from to fill your order, we don't. In fact, companies that have huge warehouses full of inventory, usually only stock a limited selection of top sellers. In fact they will usually drop items that don't sell because it costs too much capital to produce and store the inventory on slow moving items. We can't hope to compete with those "big box" shops on either price or volume, so we don't even try. The reason you likely have some to us is that nobody else makes what you are looking for. We can "afford" to have items we might only sell a few of a year, since if nobody orders that item, it costs us very little as we don't manufacture the item until it is ordered. One way to be able to stay in busines making relatively low volume products is to make a variety of different items. So when we produce items, instead of making one X then one Y then one Z then another X, etc., we instead try to group up similar orders and make up similar components of those orders at the same time, so we would make 2X's, then Y then Z. It is more efficient in terms of machine setup, etc. to do this, so we can keep out costs down. But it can result in a delay in you getting your order. If you happen to order the day after we just finished a run of the item you ordered, it may be a week or two before we get back to making that exact part. Also, if your order includes 10 different items, it is going to take longer to fill your order than it if for another order that may only need 2 different items. And some items we do make in larger volumes, so if you happen to order when we have some of that item in stock, you may get it right away, but if we are out, then it will take some time to make another batch of that item. So this is a case where making many of a part may be faster or it may be slower, just depends on what we have in stock the day you order. So when you ask us "how long will it take? ", we really can't give an exact time, we'll probably send you a link to this section of the web page. Parts are shipped via US Mail by default. Delivery time depends on shipping distance and method, Priority Mail is the default shipping method, 2-3 day typical delivery time in the US and 6-10 days for international delivery. Parts may also be picked up in the SF Bay Area of California if you prefer. An acknowledgement will be sent by e-mail when your order is received. If the order was placed via Paypal, you'll see the transaction status change to "In Process" once the order is received or "On Hold" if further information is required. Note that "In Process" indicates that the kit is IN the PROCESS of being fabricated to your specifications. Unfortunately, due to some changes made in the Paypal order system, this feature is not working at the current time. If you don't receive an e-mail confirmation from us, it might be your order was one that we did not get notified about, so feel free to send us a copy of your order confirmation so that we can look it up in our on-line system. A package tracking number will be e-mailed to you, if applicable, when the parts ship. Again, on Paypal orders, a shipping status e-mail will be sent from Paypal with any applicable tracking information and likewise, the transaction status page will show the same information and your package will generally be shipped the same day you get the shipping notification e-mail. Note on orders shipped via US Mail, the tracking number may not update as frequently as with other carriers. This is because the tracking number is only guaranteed to be scanned upon delivery of the package. You may be able to get more accurate tracking information by taking the tracking number to the Post Office and have them look up the status on their internal system. And just like the hamburger place, 4Crawler Offroad does not keep stacks of orders sitting around that are ready to ship. When your order is complete, it is boxed, labeled and dropped off at the shipper typically on the same day. What if something is wrong with my kit when I receive it? If the package was damaged in shipment and some parts fell out or if you think you received incorrect parts or are missing parts, please be prepared to provide photographic documentation of the contents of the package. Contact 4Crawler Offroad via e-mail and state the nature of the problem and attach any images you have. If parts are missing or damaged, 4Crawler Offroad will attempt to send out replacements in a timely manner and also file a claim with the shipper on insured shipments. You must of course request insured shipping if you wish to have that coverage. If parts of of an incorrect size or application, please let us know and we'll try to work out the issue. The only way that 4Crawler Offroad will know about these sorts of issues is to get feedback. And it is not unheard of to run into a vehicle with odd-sized hardware, probably happens every few years. We'll ship hardware exactly like we have used on many dozens to hundreds of similar vehicles only to find out on one particular vehicle that the mfg. changed the size. 10. How large a tire can I fit with X" of lift? There is no way to provide an exact answer to this question, at least in general. There are so many variables, the actual diameter and width of the tire, the profile of the tread, the size and offset of the wheel, the suspension mods on the vehicle, your willingness to make minor of major mods to the body (fender trimming) all come into play. The best bet is to locate a lift vs. tire size chart for your vehicle and see if that helps. For example, if you have a Toyota Tacoma, then the Tacoma Territory Tire and Lift FAQ section should have your answer. If you have a vehicle that is similar to another, for example the 3rd gen 4Runner and the Tacoma are very close in design, so the above lift vs. tire size chart should be pretty close. Or the FJ Cruiser and 4th gen. 4Runner are almost identical to each other, so expand your seach to similar vehicles. Find a vehicle specific forum and ask other owners what they are running, lift-wise for a given tire size. There are lots of on-line forums where it should be easy to find someone with a similar setup to what you want to do. There is a good write-up on the inner fender trimming process (aka Pinch Weld Mod) about half way down this web page. Short of a vehicle specific forum, you can try measuring. A body lift will raise the body up and most tire fitment issues are with the front wheels, because of the steering. See if you can find the worst case suspension/steering combination and then carefully measure clearance around the current tire and allow for the larger tire. For example, assume you want to go from a 31x10.50 to a 33x12.50 tire on the same rim. The new tire will therefore be 1" wider on the inside of the wheel, 1" wider on the outside and will extend 1" farther out from the wheel. So, if you had a 1" square block and could run that around the face of the tread and sidewalls all they way around the wheel well without hitting anything, chances are that tire would fit. If it does hit something like the fender, would raising it, say 1", make any difference? If it hits some part of the steering or suspension, then a body lift won't help. Another way to measure would be to use a bumper jack to lift one or both ends of the vehicle up the desired lift height and then do your measuring with that simulated body lift. This is fairly safe to do, you are not actually lifting the tires off the ground, just taking a little weight off the vehicle and letting the body rise up an inch or two to simulate where it would be with a similar amount of body lift. That way you can see exactly how it will look and measure to the "pinch points" where rubbing might occur. And you can try and correlate clearances measured raised and lowered to see what affect various lift heights will give you. On some of the later model Toyota vehicles, you may find that the A-pillar body mount bracket is a limiting factor on tire size. You can raise the body with a body lift to let that clear the tire, but the body mount bracket itself is attached to the frame. It will stay there after a body lift. You can find write-ups on-line on how that bracket can be modified for additopnal tire clearace. 33x12.50 on 15x8/4.75" backspace wheels needs 1" body lift, and front torsion bar lift (1"-2") or 1.5" ball joint spacer and some sort of rear suspension lift (such as longer spring shackles or a coil spring spacer) to level the truck, plus some fender trimming. Here is a picture of this combination showing the minor front fender trimming needed to fit the tires. Conventional wisdom suggests a full 4" IFS lift for this wheel/tire combination, but using a combination of milder lift components will produce the same end result that will function as well if not better than the taller all-in-one lift kit and at less cost. And in case you think this won't work, take a look at this very combination in action in 4x4Wire's Hot Toys write-up on Don West's '94 pickup. 35x12.50 on 15x8 w/ 3.75" backspace wheels needs 4" IFS suspension lift plus 2" body lift for good fit. Many IFS lifts require less backspacing on the wheels to clear the dropped A-arms, this in turn pushes the wheels/tires out farther from the body, making tire/body contact more of an issue. The 2" body lift can help reduce rubbing. Less lift may be possible with more fender trimming. With all lifts, whether body or suspension: "Lift as much as needed, but as little as possible"
What this means is that for best results add as much lift as needed to meet your needs but no more. If 1" of lift is enough for your application, going to 2" or 3" is just extra cost, more installation issues you may encounter, etc. So, I want to do a mild lift, which type of lift do I choose, suspension or body? Ideally, you would want to get the suspension set up first. Why? Because suspension lifts are the most variable in terms of how much lift you will get. That is you may get more or less lift than the kit was "advertised" to provide. Nothing wrong with this, it is just life. Your vehicle may be lighter or heavier than what the kit was designed for. Also, things like springs settle over time. Also suspension lifts vary in flexibility, so your new suspension may or may not allow the wheels to compress up as much as stock. All this said, if after setting up the suspension to your liking and installing the desired size tires, and you find out you get some tire rubbing, then is the time to size up the body lift. When you can see how much tire rubbing you are getting, you can decide if some inner fender trimming is all that is needed, or if raising the body up vertically 1", 2", etc. is what is needed. 11. What if I already have a body lift and want to remove it, reduce it's height or adapt it to another vehicle? 4Crawler Offroad is happy to work with you to do this. We can offer kits to replace the body mount hardware to restore the vehicle to stock height. We can also supply lower height lift blocks in almost any combination and can also supply components needed to adapt a lift kit for one vehicle to another. Just drop us a line and we'll be happy to help you with your project. If you have a vehicle with an already installed body lift and you want to remove it, for many vehicles listed below, simply order the typical 0" kit to get a set of stock height hardware to allow for a body lift to be removed. Or you can simply measure the length of the bolts you are removing and then subtract the height of the lift blocks you are removing to come up with the length of bolts needed to replace the extra long lift bolts. And removal is the reverse process of installation. In short, you'll need to remove all the relocation brackets that were installed with the lift. 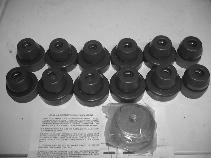 These may include the bumpers, radiator, steering shaft, gas tank filler hoses, etc. Then you'll remove the body lift blocks and longer bolts, lower the body down and the replace those bolts with the stock length bolts (kit D as mentioned above). One question that always comes up when removing a body lift is what about the body mount bushings? One common misconception is that a body lift replaces the body mount bushings with the body lift blocks. Except in a few cases where the body lift is done via taller body mount bushings, you generally leave the body mount bushings in place and then add the body lift blocks between the body mount bushing and the body, as noted in this section of this web page. Now that is not to say that you might want to replace the body mount bushings along with removing the body lift. 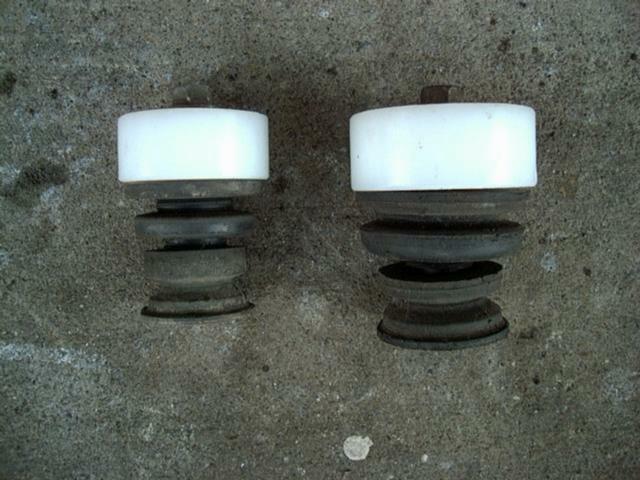 Inspect your body mount bushings and see if they are worn out or damaged. 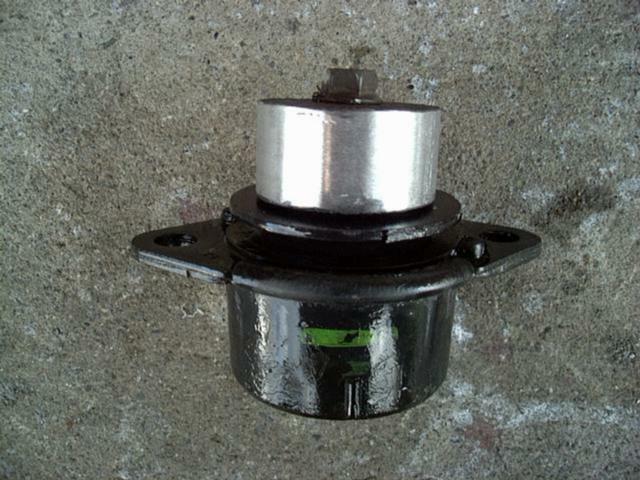 With the older factory rubber body mount bushings, time and the added wear and tear of the body lift blocks (especially the undersized blocks commonly used in the various after market kits out there), those bushings may be ready for replacement. 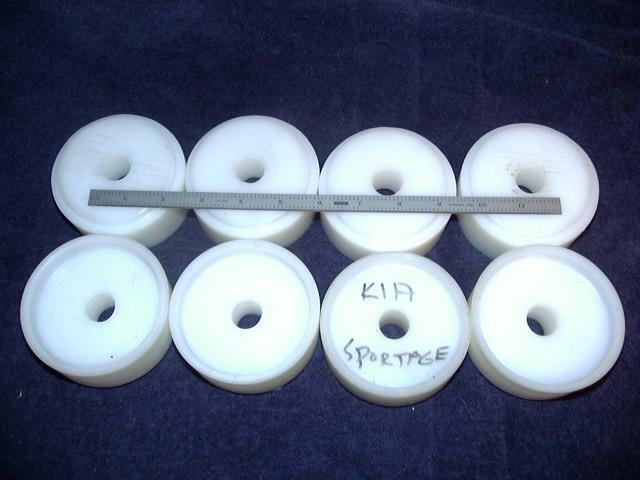 Simply add kit P to your parts order and get a new set of poly urethane body mount bushings to swap out for the worn out rubber parts. And there is no better time to do this, as you'll have perfect access to the body mount bushings when you remove the body lift. 12. I'm looking for an "RB" or "Roger Brown" body lift kit, where do I find that? 4Crawler Offroad is the name of the company that was created and is owned by Roger Brown. So some people mistakenly call the kits "RB" or "Roger Brown" body lift kits. 4Crawler Offroad would like to encourage everyone to use the official company name when referring to these products to help avoid confusion and for legal reasons as well. It would be the same as walking into your local computer store and asking for a copy of "Bill Gates Word" or "Larry Ellison Database" software. Hopefully you would get what you were looking for, but you may not. So, to answer the Frequently Asked Question "Where can I find an RB body lift kit?" The answer is there is no such a thing. 13. What are bed spacers and do I need them? In many vehicles, the bed of the vehicle rests on the frame without being physically connected, as at a real body or bed mount bracket. This typically happens under the rear wheel well, where it would be difficult to add a support bracket to the frame to attach the bed to. Instead, the bed rail (on both pickups and also on many full-bodied vehicles like 4Runners) simply rests on the frame rail. In cases where the bed is heavily loaded and tries to sag, that point of contact will support the load in the bed without it bending in the middle. This is mainly useful if you carry heavy, unsupported loads, such as sand, gravel, sod, etc. If you instead carry loads like a motorcycle, lumber or other cargo capable of supporting itself in the middle, then the bed is less likely to sag. When a body lift is installed and the bed is raised above the frame, this contact point no longer is effective. This a "bed spacer" can be attached to the frame to provide a raised point of contact for the bed. 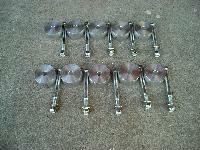 So the questions that come up with bed spacers are do you "need" them and how many do you need? Need is determined by how you use your vehicle, specifically for cargo carrying. If the most you put in your vehicle's bed is a cooler and pair of folding chairs, then you probably don't need the spacers, at least to support the bed. If you haul heavy, bulk cargo, then yes, you do need them. And as to how many? Look at your vehicle, locate and count the number of places the bed rests on the frame. Typically there is just one contact point on each side in the rear wheel well, you one pair of spacers is what you need. Some pickups, have to sets of contact points, but they are nearly at the same place. So you could get by with one pair or put spacers at both pair of locations. It is all up to you and what you want your body lift to encompass. 14. I already have a suspension lift and have some tire rubbing, can I add a body lift on top of the suspension lift? Sure, there are generally no issues combining the two. 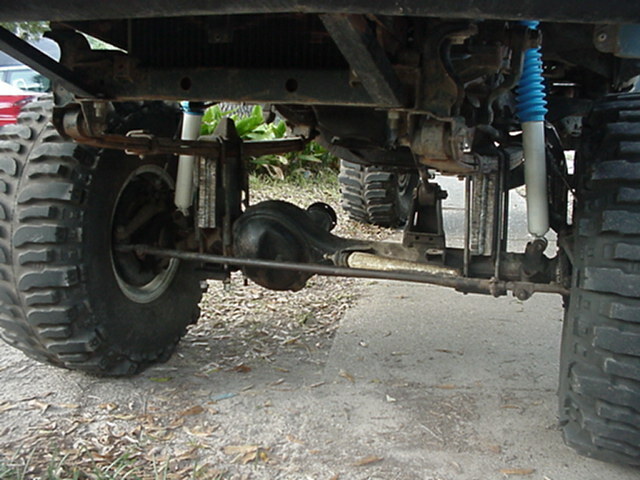 A suspension lift raises the frame above the axles. A body lift raises the body above the frame. If you consider the two lifts, you could imagine supporting the frame on jack stands and removing the front and rear axles, the body would not "know" the difference. This would be an "infinite" suspension lift, not very practical, but just to illustrate the point. Likewise, imagine removing the body entirely from the frame and moving it some place else. This would be an "infinite" body lift, again not practical, but illustrates the point that the frame, suspension and axles could "care less" that the body is not present. Practical suspension and body lifts leave their respective parts connected and just provide a reasonable amount of lift. So, within reason, a suspension lift and a body lift can be installed on the same vehicle. This is often a good combination, letting a mild suspension lift be combined with a mild body lift to allow a larger size tire to be fitted without rubbing than could be fit with one or the other lift alone. Likewise, the cost of say a 2" suspension and 2" body lift may by much less than to buy a full 4" lift kit with complex brackets, etc. And, if you need for example 4" of total lift to fit a given size tire, you can generally add the combined height of the suspension and body lift to get to this total lift height. So if you had say a 2.5" suspension lift, you could add a 1.5" body lift to reach that desired 4" total lift height. 15. Is 4Crawler Offroad still in business and making body lift kits? Body mounts are what connect your trucks frame to the cab and/or bed. For strength, pickup beds are typically bolted directly to the frame, while the cab is mounted with compliant bushings (usually rubber or polyurethane) to isolate the cab from road noise and vibration. Starting at the front, there are two mounts behind the bumper, two more are located at the front foot well, two more behind the front seats. Then, in the 4Runner, there are two more in the rear passenger seat well, and two more at the rear of the cargo area. The pickup has 8 mounts on the bed (4 on each side), two near the front of the bed and two near the rear. You should try to locate each mounting point, and be sure you can gain access to both the top and bottom of each mounting bolt before undertaking a body lift. The body/bed are connected to the frame by the mounts, as described above, to brackets (or horns) attached to the frame. In a body lift, spacers are installed between the body and the mounting brackets or bushings to lift the body above the frame. 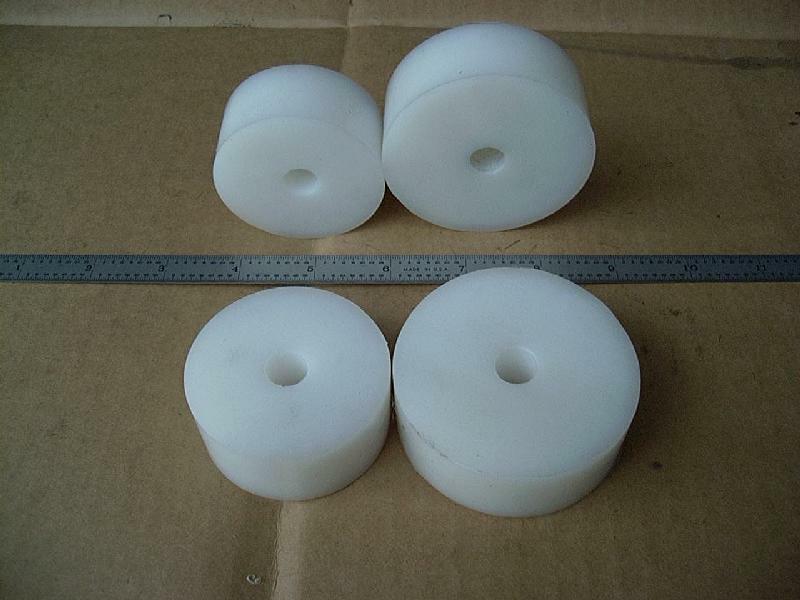 From the factory, you'll find rubber body mount bushings. Over time, the rubber cracks and weakens with age. This can lead to what is called "shudder", which is a sort of side-to-side shaking felt when hitting bumps on the road. 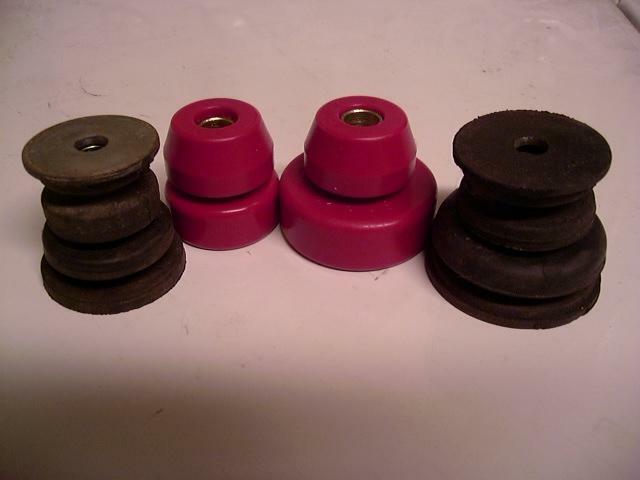 I tried everything to correct this problem on both my Toyota Landcruiser ('74 FJ-55) and later on my '85 4Runner, but nothing seemed to help until I installed polyurethane body mount bushings. It seems counter intuitive, that putting on a stiffer, less compressible bushing material would actually reduce this vibration, but that's what seems to happen. I think the vibration is actually caused by the relative motion allowed by the softer rubber. In technical terms, the resonant frequency is proportional to the stiffness of the compliant member. The rubber is soft and very compliant, leading transmission of the low frequency shudder, that is within the frequency range of bumps transmitted up from the road. The stiffer polyurethane (approx. 92A durometer), shifts the resonant frequency up to a higher value, which is effectively absorbed by the suspension of the vehicle. There is a metal bushing that goes inside the poly bushings, it gets sandwiched between the two washers outside the poly bushings and keeps them from getting compressed too much. When you tighten down the bolts, you bottom out this internal bushing. 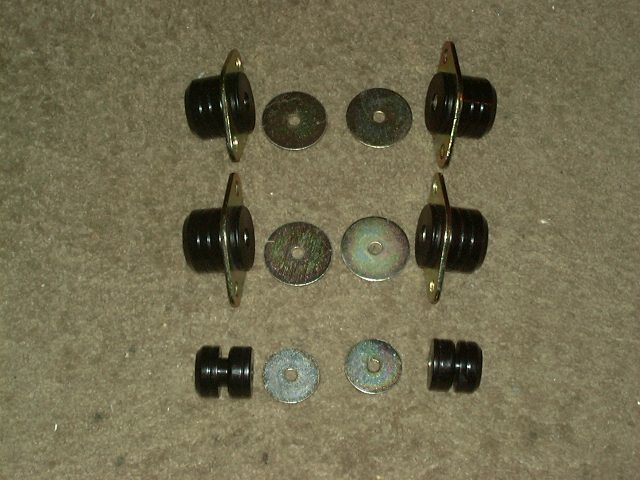 Note that not all vehicles will have all the parts below, for example, washers may or may not be present, bushings may be two-piece (as pictured below) or one-piece. You can think of the body mount bushing like an Oreo-type cookie. The top and bottom washers are like the cookie wafers and the rubber part is like the creme filling. Without the sleeve in between the washers, the filling (i.e. 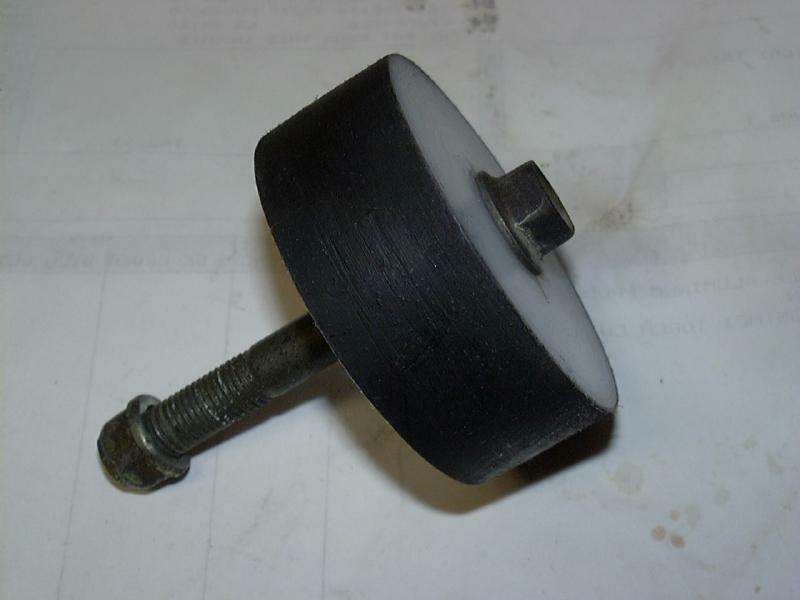 rubber bushing) would squeeze out when you tightened the body mount bolt. Since the body lift blocks are not compressible, they do not need a sleeve or top/bottom washers to work. Rather they just get clamped in between the top washer of the body mount bushing and the floor of the cab/body. The clamping force of the body mount holds the block in place. One concern with body lift blocks is possible electrolytic corrosion due to dissimilar metals touching. This can be a problem with aluminum blocks and the steel of the body. If you wish, you could apply a heavy paint or spray-on undercoating to the top of the blocks. Anotehr option would be to cut out some plastic washers from an old plastic milk jug and use that to separate the aluminum and steel if desired to prevent possible electrolytic action. The big advantage of the UHMW polyethylene body lift blocks is that they eliminate this possible problem, as polyethylene is inert and self-lubricating, so you won't even have problems with the paint wearing off the steel and causing rust as is common with extruded fiberglass blocks. What exactly is in a body lift kit? So, which vehicles do these kits fit? What is listed below is information on all the vehicles we have sufficient information to construct a body lift kit or components for. If what you need is not listed below that means we do not have sufficient information required to design and build that component or vehicle kit. If you would like us to design any not-listed components or kits, see this section of the web page for the required information. Almost every kit listed below has been designed from information supplied by customers just like you. Note that these are not complete kits, for other hardware/brackets, see this section of the web page. 2" OD blocks/ea. 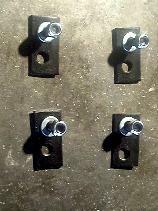 : $5.00/1", $6.50/2", $8.00/3"
2.5" OD blocks/ea. 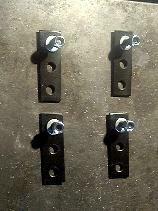 : $7.00/1", $9.00/2", $11.00/3"
Bed spacers/pr. : $10.00/1", $12.00/2", $14.00/3"
Note that there is some variation in the bolt lengths for the Nissan Frontier pickup models. So to ensure best hardware kit fit, you may want to send us the measurements of the bolt lengths and diameters for your particular vehicle so we can verify problem bolt lengths for the body lift kit. If you have 2 or more longer bolts, then add $25.00 to the hardware kit price for those longer bolts. Bed bolts are 10mm in dia. and all the same length, 6 in total. If it's easier, we can send the default hardware and then if needed work with you to exchange needed bolts afterwards. $50.00 - up to 1", $65.00 - up to 2", $80.00 up to 3"
$48.00 - up to 1", $64.00 - up to 2", $80.00 - up to 3"
$60.00 - up to 1", $80.00 - up to 2", $100.00 - up to 3"
A close fit is an important design feature as it keeps the body from shifting around on the frame, taller lift blocks have slightly larger holes drilled to ease installation of the longer bolts. On UHMW blocks taller than 1", you may notice a slight deviation of the hole from the center of the block due to variations in the block diameter in the extrusion process. Since the blocks are slightly oversized in most applications, the slight offset from center has no affect on the function of the block. Cost is $9.00/ea for the 1" tall blocks; taller blocks not available. Available in 2", 2.5", 3" 3.5" nominal diameter blocks. UHMW is a dense plastic, that will eliminate possible corrosion and squeaking problems that could potentially happen with a metallic block. The Ultimate blocks are the same diameter as the larger cab/body mounts so offer the ultimate in strength, both in the block itself as well as spreading the load of the body over the sheet metal contact point. It is 3.5" in diameter with an integral "cup" to contain the rubber body mount bushing as well as a tapered end that fits into the "cup" on the underside of the body. It has a 19mm center hole to accommodate the factory body mounts bolts and is the tallest lift possible with the existing hardware, a total of 8 are required. Standard, heavy duty, stainless steel and metric. Heavy duty bolts are about 25% stronger than stock and will fit into the stock mounting holes and body washers with some slight modifications. Stainless steel hardware is rust resistant. Metric hardware is just that, same diameter and grade as stock, although thread pitch and head size may differ from stock. 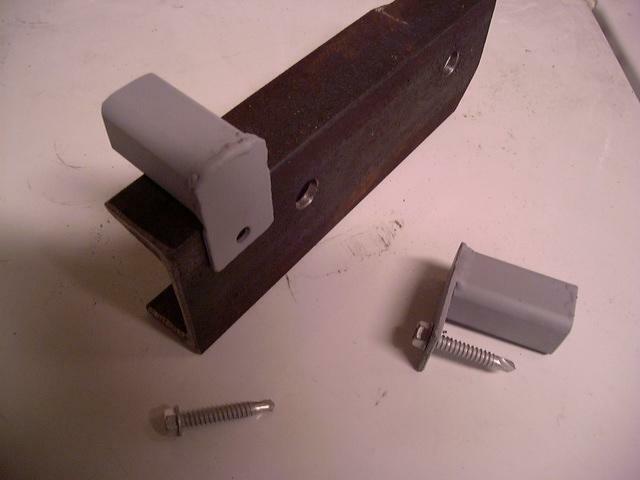 The pickup bed bolts (or nuts) include tabs (like stock, where applicable) for ease of installation. Hardware is SAE Grade 5 or better, which combines good tensile as well as shear strength. Hardware kit allows existing rear bumper brackets to be modified to match body lifts from 1"-3" and re-use the stock bumper bracket bolts. For certain vehicles, there are places where the bed or body is supported by contact with the frame. While the body lift blocks and longer bolts will properly support the bed or body, for added load capacity, a separate bed spacer can be bolted or welded to the frame to provide a contact point. If you want just the blocks, you have to buy the whole kit and throw away the parts you don't need. If you want shorter blocks, you cut the taller blocks in two and throw away the parts you don't need. Much of the hardware supplied is specific to the amount of lift in the blocks, so it can't be re-used. Bolts only have thread on the lower inch or so of the bolt, so if its shortened more than this, its no longer a bolt, its just a round rod with a hex head on top. So, 4Crawler Offroad has chosen to supply a body lift in an "ala carte" form, e.g. you want blocks, you order the blocks; you want bolts, you order the bolts, etc. Here is a list of some common combinations of parts that are typically ordered. 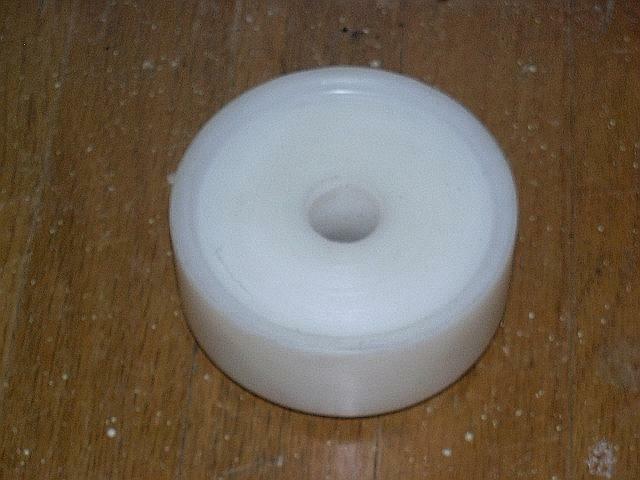 While not required, it is a good idea to check the condition of the stock rubber body mount bushings and if cracked or worn out, change them to polyurethane (PU). PU will withstand the added strain of the taller body lift, and it actually transmits less noise and vibration from the frame to the body than rubber. If planning to install a body lift kit on your vehicle, it is a good idea to inspect your original body mount bushings to see what condition then are in. Look for any deep cracking or tears in the rubber bushings. And with the one piece bushings, look for separation of the rubber from the surrounding steel bracket or places where the bushings have collapsed and are allowing the body to rest directly on the frame bracket (usually you'll hear squeaking or rattling noises if this happens). If you have any doubt about the condition of the original rubber body mount bushings, there is no better time than when installing a body lift to swap out those bushings, since you can easily swap out the bushings prior to putting in the body lift blocks. Especially on the newer model full bodied vehicles, the trend is the the mfg. to install taller, softer rubber bushings for a quieter ride on the road. However, in off-road use, those large squishy factory bushings can allow excessive body movement relative to the frame. If you have aftermarket bumpers, rock sliders or other trail protection (like a roll cage) install, the body may move enough to make contact with that trail armor and cause noise. Also, those soft rubber bushings are more prone to tearing when subjected to the extreme stresses of off-road driving. In these cases, the firmer polyurethane bushings are a good upgrade. 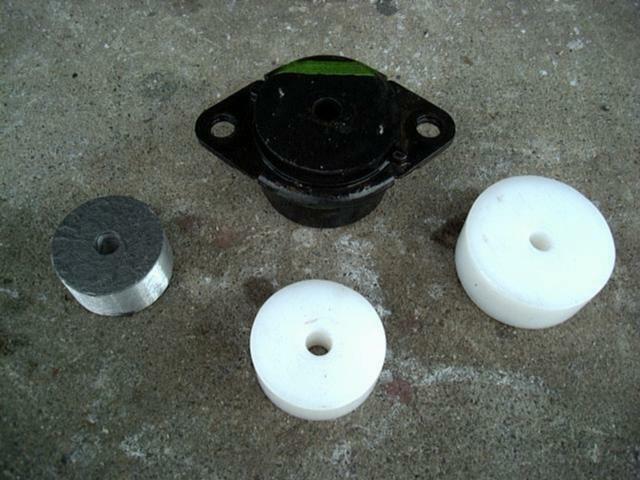 What makes the bushing kits offered by 4Crawler Offroad different than those from other companies? We offer kits for many vehicles for which there are no aftermarket kits available. We offer any combination of bushing components, if you need 1 or 2 bushings or need to add or subtract bushings from an existing kit, no problem. 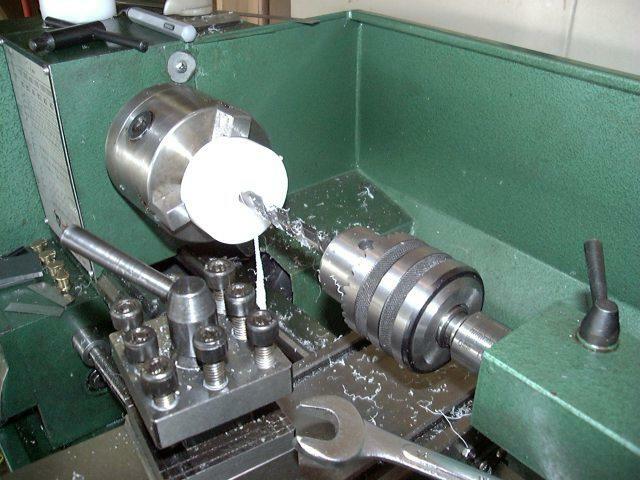 We hand inspect and test-assemble each bushing kit in most cases. Amazing as it seems, we find that at least 25% of the boxes of supposedly complete bushing kits we open are missing parts. So we try and make sure each kit is complete and order extra parts from the bushing mfg. to make up any shortages before the bushing kit gets to you. 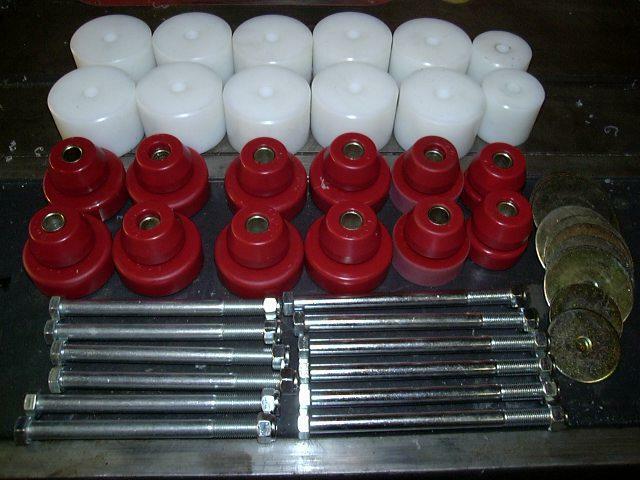 We custom drill all the bushing washers to fit the size hardware you'll be using with the bushings. Most aftermarket bushing kits will not work with stock size hardware, strange as it seems. So let us know what size/diameter hardware you plan to use with the bushings, and we'll do our best to accommodate that. There may be an additional charge to drill out these components, or you are welcome to perform that operation yourself. We also hand assemble our bushing kits, where possible, to ensure that the kit is complete and that all the separate components fit together. You would be amazed how many "bad" bushing kits we get and have to "fix". 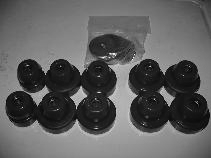 Note that PU body mount bushings will likely look different than the OEM rubber bushings. There are several reasons for this, mostly to do with the different materials and molding operations. Rubber tends to be "squishier" than PU. 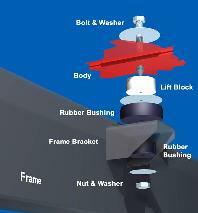 As such, bushings are often designed to compress to a greater degree when made of rubber. So they will appear taller when uncompressed. Also, OEM rubber bushings are often molded with washers, sleeves and other metal parts bonded together inside in complex clamshell molds. This is how rubber has to be molded, it's put in a mold and then put under heat and pressure to allow the vulcanization process to occur. PU, on the other hand, is poured into an open mold as a liquid then heated in an oven to cure the polymer. PU molds have to allow for the cured part to be removed and thus they can't have the intricate ribbing and details like the rubber bushings. Case in point, look at the tire on your truck and compare that to a PU skateboard wheel. Also, with PU, the exact mechanical properties, like durometer, can be easily controlled by the polymer ingredients. With a rubber bushing, you have less control over the material properties and instead rely on the bushing shape to produce the desired bushing properties. That's why the rubber bushings often have complex ribbing and narrower/thicker sections to allow for the desired compression characteristics. Pickups have no bushings between the bed and the frame. Available in black or red by special order. 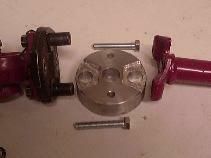 (all years) - $160.00 - 10 body mounts, with 2 - small, 6 - medium and 2 - large diameter typical, see note 3 below. On some Generation 2 Monteros, the front pair of body mounts is a 1 piece unit and can't be replaced. If so, leave these body mounts as-is and replace the remaining ones. You can order a kit with 2 fewer mounts if this applies or return the unused bushings. The bushing kit may not fit the 1994 Pajero Exceed model which has more oval shaped mount mount bushings. Note: Bushing kit prices typically discounted with body lift kit purchase. The 62mm OD bushing will increase to 68-70mm, the 45mm OD, etc. The height will decrease (for example the 21mm height will drop to about 19mm) as the bushings are compressed. The small bushings do not compress much at all as they have less weight on them. Heights also do not include the separate top washer (factory washers are bonded to the upper bushing half), and that washer is approx. 3mm (1/8") thick and the diameter of the washer matches the diameter of the bushing. A typical polyurethane pickup (1st/2nd gen) / 4Runner (1st gen) cab/body mount kit. With all 10, you have a 1st gen. 4Runner kit. Also shown at the top are the new top washers which are drilled to accept either stock or or the larger body lift mounting bolts. The stock body mounts have the washers bonded to the rubber, so they can't be easily re-used. Please advise what you need so that proper size bushings can be supplied. The main issue is that the large size bushings will typically not fit into the medium sized bushing cups on the frame brackets as they are approx. 62mm in dia. and the cups are 55mm in diameter. Your vehicle may have bushings with 65mm - 70mm diameters and those will be replaced with the kit's large diameter bushings. Pictured above (3) you can see a kit with 4 - smaller and 8 larger bushings (total of 12), your mix of sizes will vary to match your vehicle. Note, the above dimensions are measured un-compressed. In the compressed state, the outer diameters will increase (for example the 62mm OD will increase to 68-70mm) and the height will decrease (for example the 21mm height will drop to about 19mm) as the bushings are compressed. Note that the medium (55mm) bushings are cut down on a lathe to reduce the diameter to fit the 55mm dia. frame bracket cut. As such, their exterior surface will be a rougher finish than the small and large dia, bushings. It will not affect their operation or durability, but if you want to have a similar appearance to the non-machined bushings, you could spray the bushing circumference with a black vinyl paint. That will dry to a shiny, smooth black finish and be stretchy enough to accommodate the bushing flexing. The other option is to remove any 55mm cups on the frame brackets (with a grinder or cut-off saw) and then use large instead of medium sized bushings. 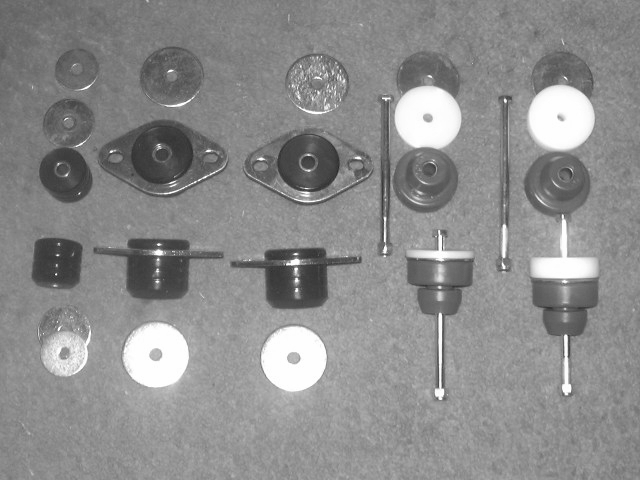 2nd Gen 4Runner ('90-'95) body mount bushing kit, a hybrid kit of 6 1-piece bushings and 4 2-piece bushings. Note the arrangement of the bushing parts, shown front-rear (left-right) and the thin (1/4") and thick (1/2") spacers, or with a body lift, the rear most lift blocks will be 1/4" and 1/2" taller than the rest of the blocks, respectively. 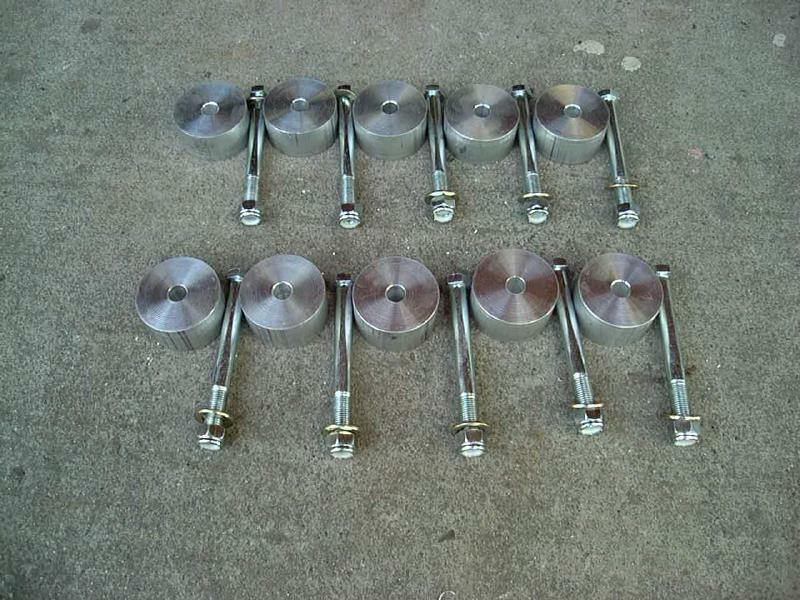 With stock hardware, you can re-use the existing bolts, but if purchased with a body lift kit, then the 4 rear most bolts (shown in the photo but not included in the bushing kit), will need to be 1" shorter than with the OEM mounts. If you want to replace the body mount bolts along with the bushings, you can order our 0" (i.e. stock height) hardware kit, see the 4Runner kit page for details. With no body lift, you'll have an assortment of thin spacers to make up height differences between the stock and replacement bushings and with a body lift, the lift blocks will have differing heights, ranging from 7/16" to 7/8" taller than the ordered kit. Again, this is to make up for the difference in height between the stock body mount bushings and the new poly bushings. When installed, the combination of the shorter poly bushing and the taller block will be the same height as the stock bushing and shorter block. 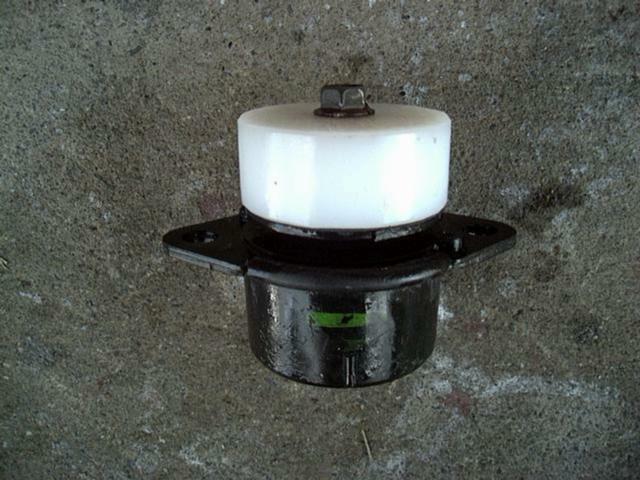 If you want to change the color of the bushings, you may be able to paint them after installation. Clean the bushings off with a good solvent, rough up the surface gloss with some sandpaper and then spray with a vinyl spray paint of the desired color once they are installed. This can also be done on the bushings that we have to reduce in diameter, such as the 60-series, 70-series and FJ80 bushings. This can help to restore the glossy finish lost when trimming the bushing outer diameter. Alternately, if uniform bushing appearance is a concern, you can always request unmodified bushings and then you can modify them or modify the body mount brackets on the vehicle to fit the unmodified bushings. 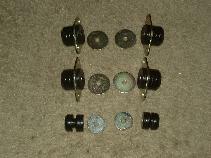 Same with any bushing hardware that we could otherwise modify. If you are building a show quality vehicle and want every part to look perfect, by all means you can get our unmodifed parts and take all the time you want to modify them in whatever way you wish. We assume customers want parts that fit a range of vehicle and do the job, so that is what we focus on. 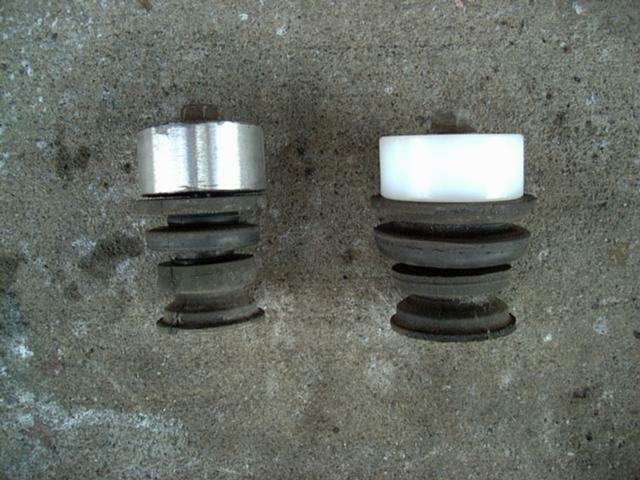 On some of the Toyota Landcruiser bushing kits, we have two options for the larger diameter bushings. 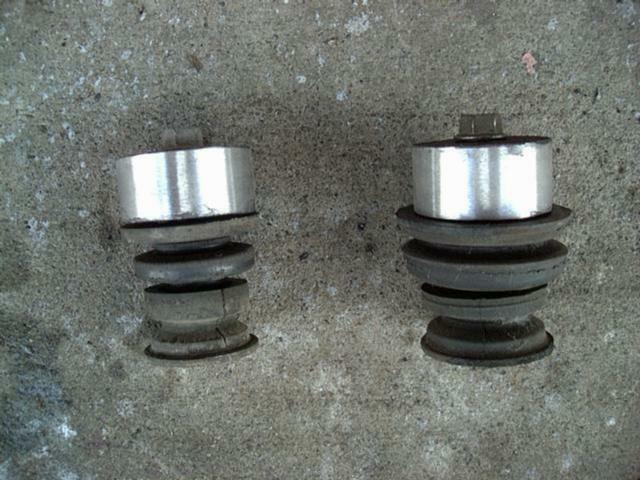 The first option is a one piece top bushing of approx. 62mm OD (uncompressed). The second option is we can supply a small center bushing with an enlarging polyurethane ring around the outside that brings the OD up to about 70mm. Let us know if you have a preference, although we can't guarantee which style parts we;ll have on hand at a given time. If you have a vehicle not listed above, that uses 2-piece rubber body mounts, and would like to see about upgrading to poly urethane, contact 4Crawler Offroad and we'll be happy to work with you to develop a solution if possible. You'll need to supply detailed dimensions of the existing bushings, inner and outer diameters, height of upper and lower halves. Basically we will need the type of information listed in the prior section regarding the bushing dimensions. For mounts that bolt onto frame brackets, we'll need to know how the mounts attach to the frame, how many bolts, what size and spacing, etc. And you can browse the available bushing kits and sizes listed above to see if there is something that is close. 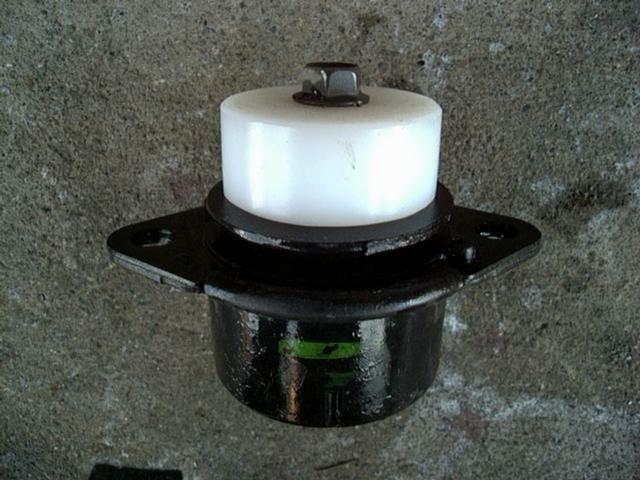 We can change diameters and heights of the various bushings listed above to fit other vehicles. But don't despair, almost all the bushing kits listed above were developed by 4Crawler Offroad based upon customer input just like requested. Pictured at the bolt-on black brackets, self-tapping bolts to fasten them to the frame (they can also be welded to the frame), polyurethane body mount bushings and bolts to fasten the body to the mount. 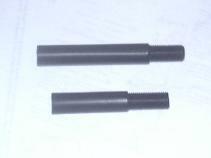 Also pictured are a pair of 1" body lift blocks, in which case the bolts supplied are 1" longer to accommodate the lift. 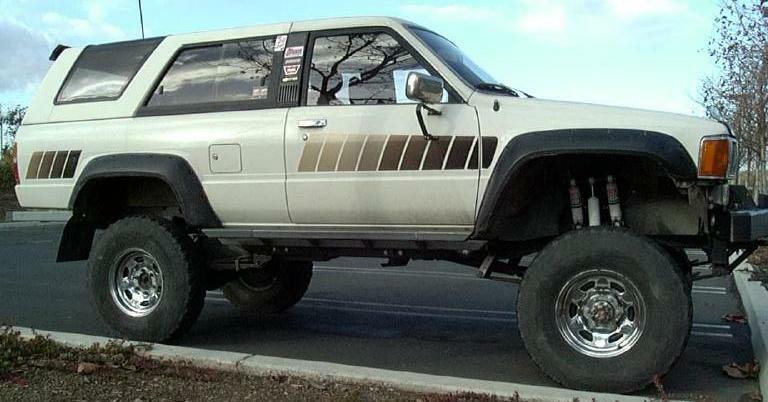 Note: This kit can be used without a body lift for added support on a stock '96 4Runner. Cost for the basic kit is $80.00 plus shipping. Add a pair of 1" body lift blocks for another $12.00-$20.00 depending on height. 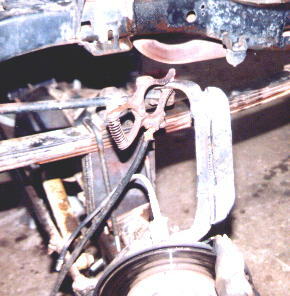 Photo A is an example of the 2-piece body mounts common in '79-'88 pickups and '84-'89 4Runners (i.e. 1st generation). The smaller mount is found under the radiator support, the larger mount is used for the rest of the cab/body, 4 in a pickup, 8 in a 4Runner. On top, from left to right, are a 2" dia. aluminum block, a 2" UHMW block, and a 2-1/2" UHMW block. Photo B, shows how the the Ultimate blocks match the diameter of the stock body mounts. On some vehicles, we do offer a Mega lift block option. The Mega blocks are typically 3" to 3.5" in diameter for those vehicles where the body mount bushings are that large and the owner wants to use a block that more closely matches the diameter of the bushing. Examples of vehicle with the Mega blocks are the later model FJ Cruisers, some 4th generation 4Runners and of course the Kia Sportage where we only offer that size. Bottom Line: The Ultimate blocks simply are larger in diameter to more closely match size of the existing body mount bushings, the Mega blocks are even larger while the standard blocks are all the same (smaller) diameter. What color are the body lift blocks? The UHMW material comes in a natural white color, as shown in the section above. As a material, it is somewhat similar to Teflon in that it is very stain-resistant and most dyes and paints will not stick. 4Crawler Offroad has developed a process by which a colored coating is applied to the visible parts of the block, for those wishing a color other than white. This process is available at an additional cost and is currently available in flat black. Click here to see an image of a colored 1" tall block . This is specified by ordering the CLR kit option. If the block coloring is slightly scratched during shipment or installation, it is easy to touch up with a flat color spray paint. The coloring process also affords UV light protection for blocks that may be exposed to direct sunlight. Generally, however, the body lift blocks are not visible or exposed to direct sunlight. But you can make that decision for yourself, examine your vehicle and look for the body mount brackets and bushings and decide if you'll be able to see the lift block sitting on top of that bushing. NEW: By popular demand, we now have a limited supply of solid black UHMW material in the 2" and 2.5" diameters. If we have this on-hand, we'll try to use it for your body lift blocks when ordered in the black color (CLR option). If you want a color other than black or white, the cost is twice the cost of the black color, so add qty. 2 - CLR kit options and specify the color desired in the order. Alternately you can order the CLR option and ask us not to paint the blocks, but the surface prep will be done so you can apply your own paint. For all pre-painted (CLR) lift blocks, you may notice some minor paint loss during shipping. It is easy enough for the blocks to be touched up before or after installing with some inexpensive spray enamel paint. It is probably best to touch up the blocks after installation as you may scrape and scratch them during installation. You can also apply an undercoating spray to the blocks if you wish as that is the type of coating applied at the factory under most vehicles, so if you are looking to blend the lift blocks in to the rest of the underside of the vehicle, that is another option. Of course, the 1" tall aluminum blocks are natural aluminum color. You may paint, powder coat or anodize them to your color preference. Mounting hardware is offered in both a standard and over size and also in standard and heavy duty grade (see bottom of this section for more information on the standard size, heavy duty grade hardware). 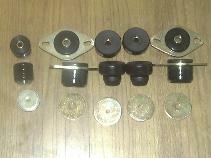 is designed to fit all the stock washers, bushings, etc. as-is, without need for modification. It is also of equal strength to the stock hardware (SAE Grade 5 ~ Metric Grade 8.8). The hardware kit cost varies depending on application. Standard grade hardware is approx. 115,000 - 120,000 psi tensile strength. The larger heavy duty hardware, is designed to be the maximum size and strength that can be installed in the vehicle without requiring major modifications. 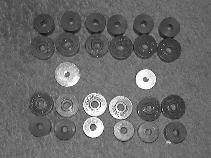 It may require re-drilling holes in some of the stock body mount washers (see installation instructions), but in the case of the pressed on tabbed washers, the oversize bolts have the larger diameter of the factory bolts under the head where they are enlarged for the press fit washer, so the old washers will often press fit back onto the new body mount bolts like stock. This option is only available on the early Toyota pickups and 4Runners and on some Tacoma models. Bottom Line: If you lack the ability and/or tools to drill holes (7/16" or 12mm or 1/2") dia. in steel washers, then go with the standard size hardware, or see below for other hardware options.. With the larger surface area, the oversize hardware is approx. 35% stronger than the standard size hardware (assuming a 7/16" vs. a 10mm dia. bolt with similar metallic strengths). For for vehicles with 10mm stock size h/w, you can request the HD hardware option and advise us that you would like the oversized hardware standard grade in place of the standard size heavy duty grade. On the 4th generation 4Runner and FJ Cruiser body lift kits, this is the default hardware option, with the stock size hardware being 12mm and the oversize hardware is 12% stronger at 1/2" and the standard size hardware is 7/16". Another option for upgraded hardware is using standard size, heavy duty grade (Grade 8) bolts, or in the case of the 4th generation 4Runner and FJ Cruiser kits, you also have the option of both standard size and oversize heavy duty hardware. This option adds approx. $15 to the cost of the hardware kit and includes Grade 8 bolts for all the cab/body mounts. You can specify the type of hardware you desire at the time of ordering. With the standard size Grade 8 hardware, no modification to the stock body mount hardware is required. This option, listed as kit HD, can be specified on almost all the body lift kits. This option is generally recommended on lifts of 2" and higher, This option is available for all applications that list the HD option in the kit. Heavy duty grade hardware is made from an alloy steel that is tempered for approx. 150,000 psi tensile strength and is in the range of 25% - 30% stronger than stock. We typically supply a heat treated Grade 5 lock nut with the HD bolts. Since body mount bolts are not torqued down to a high pre-load, the hardened Grade 5 nuts offer more than enough clamping strength. The only visible difference will be the color, the nuts will be a silver colored zinc plate finish while the bolts will be a yellow zinc chromate finish. If you want to have matching colors or must have Grade 8 nuts with the Grade 8 bolts, add the HDnuts kit item to your order, along with the HD (bolts) option. We don't list this in each lift kit pricing table, but the kit option and price should apply to all the lift kits that use bolts and nuts and offer an HD option. Note that with metric hardware, this is not an option. Likewise on pickup kits, the nuts on the bed bolts are not upgradeable and on the Tacoma models, the bed hardware is metric only and the nuts are typically part of the bed or frame and are re-used. If you don't want to re-use your factory bushing bottom washers or want an upgraded bottom wahser, we offer the HDwash kit item. This adds hardened, oversized wahsers for the bottom of all the body mount bolts. Think of a fender washer (large diameter washer with a smaller hole in the center), but way thicker and made of hardened steel. This option works well if you are installing poly body mount bushings and your original rubber bushings have the bottom washers bonded to the rubber bushing. Available for certain applications is a marine grade 316 alloy stainless steel hardware kit (316 alloy is highly resistant to salt corrosion). This option adds approx. $30-40 to the cost of hardware kit Stainless steel offers superior corrosion resistance over the zinc plated steel used in the standard and heavy duty hardware options. Stainless steel hardware is available by special order. One draw back of stainless steel is that it is only about 85,000 psi tensile strength. But if rust is a big issue for you, the world's strongest steel will lose strength rapidly as it rusts away, while stainless steel "takes a licking but keeps on ticking" to quote a popular watch commercial. And while there are higher grade stainless steel alloys available, they are very expensive and very hard to find on the extremely long lengths needed for body lift applications. If you opt for the SS hardware upgrade, be sure to use an anti-seize compound on the bolt threads prior to installing the nut. Stainless steel threaded fasteners are prone to galling when tightened and if you ever want to take the nut off the bolt in the future, the anti-seize compound will ensure the nut comes off without trouble. Pickup and Tacoma lift kits don't list SS hardware options, but we can supply SS hardware for the cab mounting bolts if desired. We are unable to source the long, extra fine threaded stainless hardware required for the bed bolts on these vehicles. Inquire for pricing and availability. The SS kit option upgrades both the nuts and bolts to stainless steel. If you also wish to have stainless steel bottom washers, you can add the SSwash kit option for an additional cost of US$20.00/kit to add or upgrade the washers on the bottoms of the body mount bolts to stainless steel. Note that this option is not listed on the regular kit pricing tables, but if a kit offers an SS hardware option, you can add the SSwash kit item to get stainless steel washers along with the stainless steel bolts/nuts. Otherwise, kits will either include zinc plated bottom washers for those kits that require washers, or you will re-use the existing bottom washers on those vehicles that have re-useable washers. Certain lift kits offer a metric body mount hardware option This option is for folks who want to retain all metric hardware on their vehicle, Although depending on bolt and nut availability, the thread pitch and head size may vary from stock, as it is very difficult to find some metric thread pitches in the extra long bolts needed for a body lift. And note that long metric bolts are fairly expensive here in the US, thus the added cost of that option. Metric Class 8.8 hardware (which is what is offered in the MET option) typically runs about 116,000 psi tensile strength, so about the same as SAE Grade 5. While there are stronger classes of metric hardware (such as 10.9 and higher), they are very hard to find in the US, and especially in the extremely long lengths needed for body lift applications. So which hardware option does 4Crawler Offroad recommend? And of course, you can also supply your own hardware, if you want all metric or something even larger or heavy duty stainless steel, it is your choice. Just let us know what diameter bolts you plan on using so the blocks can be pre-drilled to fit. And finally, why are the above hardware options "mutually exclusive"? That is why can't I order Heavy Duty Stainless Steel Metric hardware? Well, several reasons. If you look at the "universe" of bolts available, you can get most anything as long as you don't care what you are getting. But as you start narrowing down the bolt specifications, you'll find that "universe" rapidly collapses. Body lifts inherently need long bolts. Why? Well vehicle manufactures are using body mount bolts upwards of 6"/150mm long in stock form and by the nature of a body lift, the bolts have to be longer than stock, so up to 8"-9" long in some cases. Length is one factor that limits bolt availability as does size, since body mount bolts tend to be in the 3/8"-1/2" size. Then start tacking on things like Grade 5 or Grade 8 and the selection of bolts falls off, but ask for stainless steel or (at least in the US) metric, and your choices are very limited. And this is just using one choice or grade/size, but start combining them and you can just about write off any chance of finding an off-the-shelf bolt. And in fact you'll find that some some lift kit applications, certain options are only available up to a certain lift height or on certain vehicles. This is typically due to length issues, above a certain bolt length, that combination of bolt specifications is not economically available, so will be marked "n/a" (or Not Available). Sure, you can get something custom made or from a specialty supplier, but the cost in small quantities is very high. For example, look at an engine head stud kit, they use high strength alloys (190,000 psi is common) but you are looking at $15-$20 per stud and nut for that hardware. Multiply that by 10-14 bolts needed for a body lift and you get the idea. 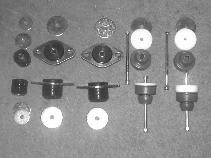 And while in certain cases, some combination of hardware options might be available, there is the cost of sourcing and stocking that rarely ordered hardware option in all the lengths and diameters needed, not to mention the space used to store that hardware is prohibitive for something that might only be ordered once every year or two. For example, we only ship a few kits a year w/ the stainless steel hardware and even less with metric hardware. What about manual transmission and transfer case shifters and clutch hoses? Manual transmissions and transfer cases have shift levers that are attached to the transmission (or transfer case) and extend up into the passenger compartment for access. Since the transmission or transfer case is attached to the frame, when the body is lifted, the shift lever "sinks" into the floor of the vehicle. With a 1" lift, this would probably not even be noticed. On a 2" - 3" lift, it probably is noticeable. The shifter(s) will still work like normal, given you address any clearance issues with the floor penetration/shifter boot(s). Most people have no issue with the lowered shift levers, you usually adjust to the change in a few days of driving. However, some folks find this situation bothersome. They are used to reaching out for the shifter and don't find it where it used to be, or they find they are missing shifts, etc. So, if you fall into the latter group, by all means, extend the shifter(s). Several options exist to correct this problem. One option is to cut the shift lever off near the base and have a sections of 1/2" dia. steel rod welded in to lengthen the shifter. This consists of one or more lengths of 1/2" steel rod, available in 2" and 3" lengths. Cost is $3.50/ea. plus shipping. Installation requires cutting the shifter down near the pivot point (where it is ~1/2" in dia.) and welding in the rod to lengthen the shifter. When doing this, you also have the option of angling the shifter in a different direction if that helps with shifter clearance. Click here for a picture of a pair of 2" weld-in extensions. Another option is an extension that can be added to the top of the shift lever. As such, the extension will have an M12-1.25mm internal thread to match the end of the shifter and an M12-1.25mm external thread to accept the shifter ball to be re-installed on top. Note that this extension will only work on shifters that have a screwed on shift knob and only on ones without any sort of switch or actuator on the knob. Also note that this extension will typically not help reduce shifter binding at the floor penetration due to a body lift, it will only lengthen the shifter. Available by special order are extensions in different thread sizes of M10-1.25 (common on Mitsubishi), M12-1.50 (common on VW and other European vehicles) and 1/2-20 (common on US vehicles). Add $5.00 to the costs below for a custom thread extension. When deciding to extend the sifter(s), you can decide if you want to du just the transmission or the transfer case shifter(s) as well. All can typically be extended, but realize you will be using the transmission shifter many, many times each time you drive the truck, so extending this shifter gives the best "bang for the buck". The transfer case shifter(s) are typically not used that much, unless you take your truck off-road every day. And even if you do, how often do you find you are shifting the transfer case gears. So there is much less benefit to extending those shifter(s), but you can if you want to. One extension will be needed for each shift lever that you want to lengthen. The extension length is measured along the smooth section, with an extra inch being threaded to accept the shifter knob. A shipping charge is added automatically with the ordering buttons above for Priority Mail delivery, please be sure to provide a VALID mailing address and international orders, provide a local telephone number for customs paperwork. One issue that shift levers can cause with body lifts is that as the shifter "sinks" into the floor, the distance from the lever's pivot point to the floor penetration is increased. This means that the shift lever sweeps out a wider arc in the various gear selection positions. 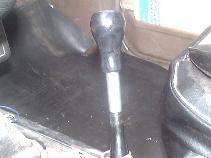 Enlarging the hole in the floor is one option or bending the base of the shift lever is another option. A simple extension, while it makes the shift lever longer, will not help alleviate the clearance issues at the shifter boot. A better option to both extend the shifter and to shorten its throw is a short shift kit. 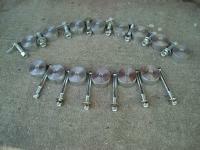 Here is a short throw kit that bolts onto the Toyota transfer case shifters. A second issue that may crop up on manual transmission Toyota trucks is the flex hose for the hydraulic clutch where it drops down from the firewall to the clutch slave cylinder. In stock form, on the '84-'95 pickups and 4Runners, the flex hose is usually good for a 2" body lift, but at 3" it may be pulled a little too tight. One option is to relocate the lower end of the hard line closer to the slave cylinder. 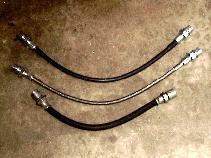 A second option is to replace that hose with a stock front brake flex line that is typically about 2" longer. This option is good if you have replaced the stock rubber brake hoses with flexible s/s hoses and have your old brake hoses laying around. A third option is to replace the stock rubber clutch hose with a longer braided stainless steel (s/s) line. This option is good if your old hose (clutch or brake) is old and cracked and you do not want to reuse it. Pictured below (bottom to top) are the stock rubber clutch flex hose (approx. 10.5" long end-end) and a plain s/s flex hose and a s/s flex hose with polyolefin cladding over the s/s braid for added longevity. 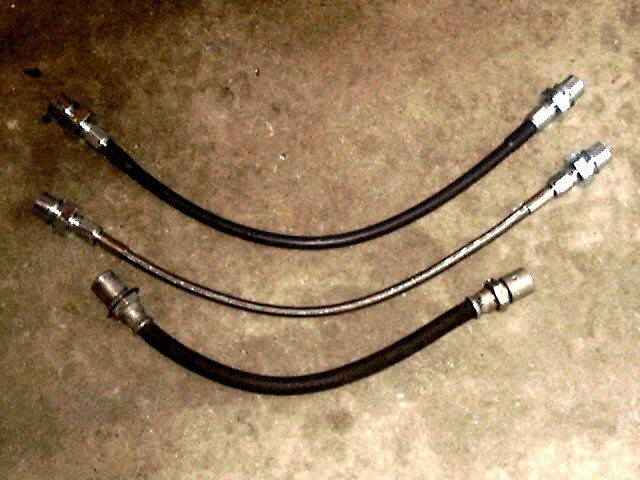 Both the s/s hoses are approx. 14" long, so 3.5" longer than stock to allow for more lift and flex between the engine/transmission and the body/frame. 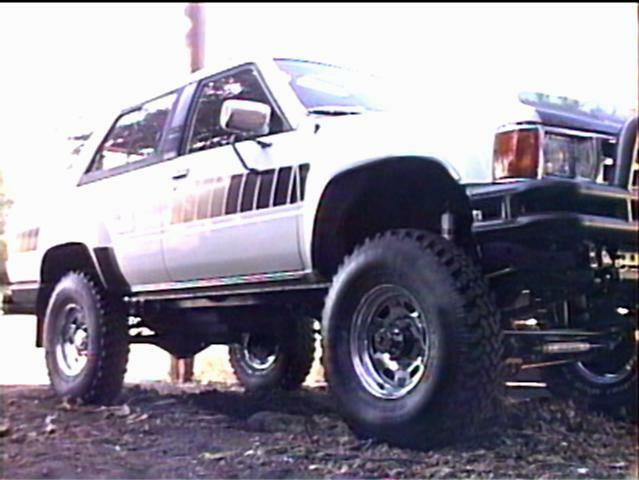 Most Toyota 4WD body lift kits would not work on vehicles with automatic transmissions. The A/T shift linkage on most Toyota 4WD pickups and 4Runner (up through 1995) consists of two main parts, the transmission shift lever and the transfer case shift lever. The transmission lever is adjustable and can handle up to a 3" body lift with simple adjustments. There are two types of 4WD, or transfer case, shifters. The most common type is an external linkage, on the other hand will only work up to about a 1" body lift without modifications. Above 1", a bracket is required that lifts the transfer case shift lever up so that body lifts in the 2" to 3" range can now be done on A/T equipped Toyota 4WD vehicles. A less common type of transfer case shifter goes directly into the transfer case, just like a manual transmission setup (see above section) and this bracket setup is not needed. You should examine your transmission/transfer case linkage to verify which type you have before ordering and installing a body lift lit. 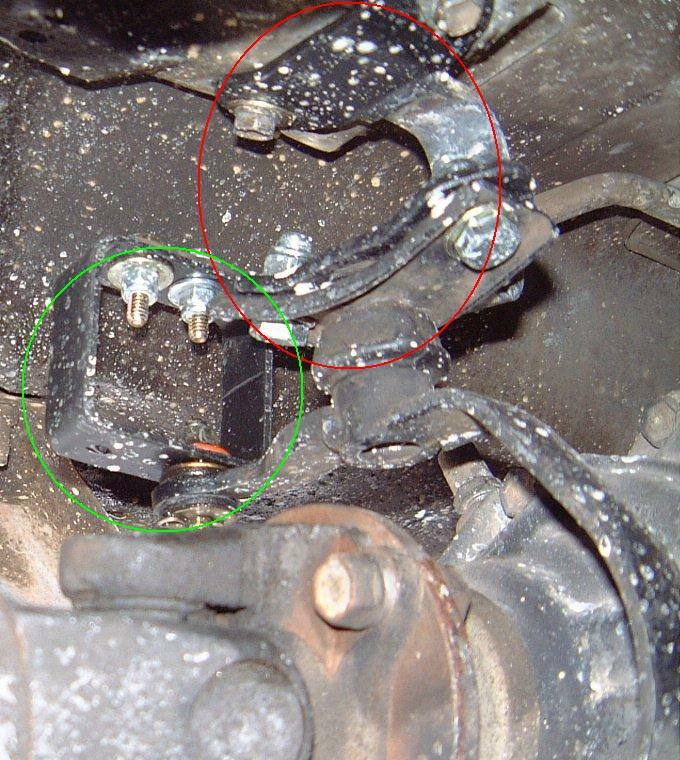 The bracket is fabricated from heavy gauge steel and includes new mounting bolts to attach the lower bracket to it, the existing hardware is then used to attach the bracket to the stock location (circled in red in the above-right image). 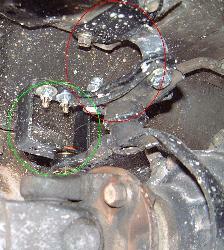 The A/T linkage extension is a bolt-on extension for the upper shift linkage (circled in green in the above-right image) to prevent binding in the 2H position. Also available for customers who have another A/T shifter bracket, the A/T linkage extension is available separately (this is the square piece in the A/T bracket kit). The linkage extension is useful in those situations where you "run out" of adjustment in the stock shift linkage. The extension allows you to raise the shift linkage attachment point up to minimize the effect of the body lift. And on the 2WD pickups and 4Runners, this linkage bracket may be the only bracket you need since your truck lacks the transfer case shifter. Again this linkage extension is typically needed at a 3" lift and optional at 2" lift. We have redesigned the A/T shifter kits so that all parts can be used on 2" and 3" lifts interchangeably. So while most folks typically only need the A/T shift lever bracket at 2", you can install the A/T linkage extension if you wish. 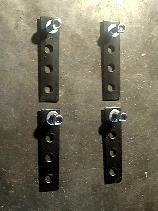 Likewise, while most folks typically need both the bracket and linkage extension at 3", some only need the shift lever bracket, so you can now mix and match the parts as you wish. Consult the installation instructions for more details. The A/T shift lever bracket is priced at $45 (typically for use on 2" lifts) or the full bracket plus linkage extension kit for $55 (typically for use on 3" lifts). If you have another brand body lift that does not include the A/T linkage brackets, this is the kit for you. A 2" or 3" lift is a 2" or 3" lift no matter what brand lift kit is used. Also you can use either the bracket or linkage extension on either a 2" or 3" lift. A shipping charge added automatically with the ordering buttons above for Priority Mail (within the US) or Priority Mail International (outside the US), please be sure to provide a VALID mailing address and international orders, provide a local telephone number for customs paperwork. You should make sure you have a linkage-style transfer case shifter. Some A/T-equipped trucks have transfer case shifters that go directly into the transfer case, just like a manual transmission truck has. If this is the case, then do not order this adapter/bracket, IT WILL NOT WORK FOR YOU. Other options are to extend the transfer case shift lever, or convert it to a short throw setup. For the Tacoma ('95.5 onwards) and 3rd. 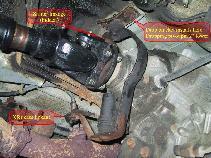 gen 4Runner ('96-'02) applications, the shift linkage only requires adjustment, no bracket is needed. 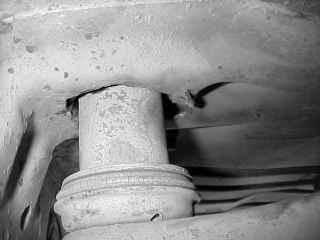 Many vehicles use a rubber "rag joint" in the steering shaft to help dampen out road vibrations in the steering wheel. It is used to joint two sections of the steering shaft via a round rubber disc. 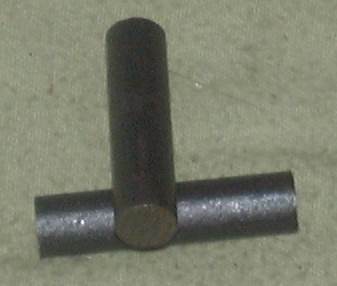 One section of shaft is attached to the rubber disc via a pair of studs. The other end of the shaft is attached via a pair of bolts or rivets. The attaching flange has two slots that fit around the studs. These slots allow the studs to move around as the rubber twists under load and vibration. Before the rubber can twist too far, the studs make contact with the side of the slots. 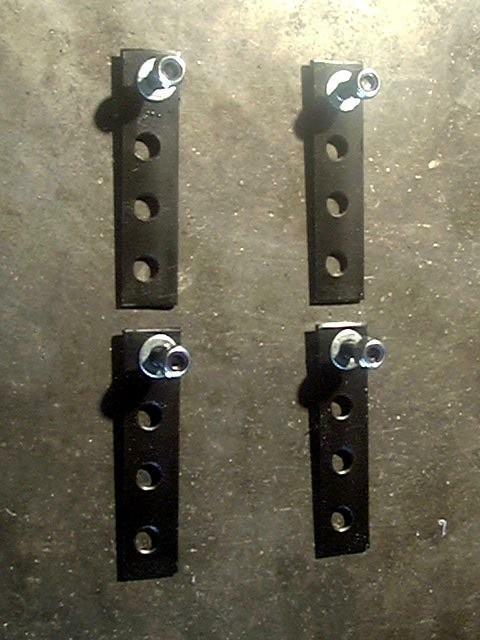 Our spacers are designed to fit over the studs with over sized holes allowing the studs freedom of movement. The spacer is bolted to the other side of the steering shaft. This way it extends the function of the slots. Many vehicles use a similar style rag joint, including Toyota, Isuzu, etc. To check if your vehicle has a silimar rag joint, the rubber disc is approx. 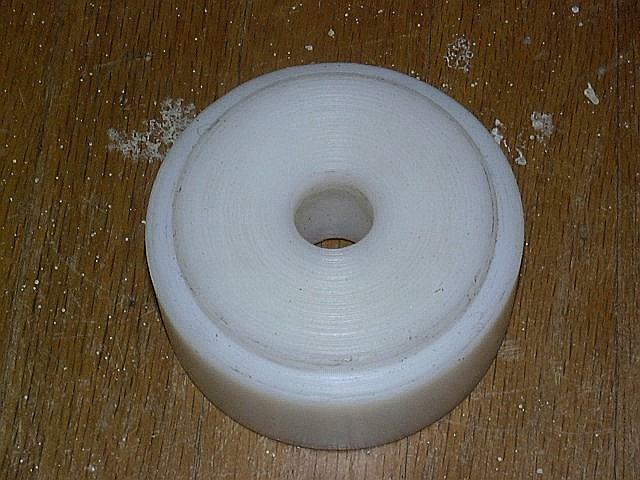 3" (75mm) in diameter and the holes are on a 2-1/8" (55mm) diameter bolt circle. Bolt size is 5/16" (8mm) and the slots for the studs are appox. 3/4" (19mm) across. Toyota vehicles with rack and pinion steering typically use a nearly vertical steering shaft that runs from the steering column penetration of the firewall to the steering rack mounted on the frame. Since the shaft is vertical, it is directly affected by a body lift. There is some amount of adjustment at the lower clamp, sometimes and inch or more of excess shaft is inside the clamp. However, it is difficult to ascertain the amount of spline remaining inside the clamp without removing the steering shaft. At the base of the steering shaft is the "rag joint", that allows for slight misalignment and also helps to absorb jolts from the road. It is possible to slightly extend the length of the shaft with washers on top of the rag joint. Beyond about 1/2" and the stop bolts on the rag joint will slip past the slots on the steering shaft and this would leave the rag joint unsupported and subject to damage. Therefore, an extension of some is required. In the above images, you can see the rag joint disassembled and the extension that slips over the stop bolts and is then bolted in between the rag joint and steering shaft. Due to the angle of the steering shaft, the spacer can be a bit less than the amount of body lift, for example, for a 3" lift, the spacer is 2.5" tall. The spacers are machined from 6061-T6 aluminum alloy for strength and come with a pair of longer bolts and lock nuts to replace the original bolts. The table below lists some typical vehicle applications for which body lift kits are available and whether that application will require extensions for the steering shaft. Note that "Y" indicates an extension is likely required to install the body lift and "N" means that one is likely not needed, although some adjustment of the steering shaft may be required (click here for details). On certain models, Toyota changed from the recirculating ball steering box to a rack and pinion type steering around 1995-6 time frame. The vehicles listed in Bold/Italic represent the rack and pinion type steering extensions, vs. the other vehicles that use the recirculating ball steering box. Easy to check which type of steering you have. The recirculating ball steering box will be attached to the outside of the frame, up in front of the front axle on the driver's side. The rack and pinion steering is located in the center of the vehicle, down low on the firewall behind the front axle. So be sure and check your vehicle to see which type of steering you have before ordering an extension. '89-'95 Toyota Pickup / Hilux N N N* Y/1"
'90-'95 Toyota 4Runner / Hilux Surf- 2nd gen N N N* Y/1"
'96 and later Hilux / Hilux Surf N N N* Y/1"
'95-'04 Toyota Tacoma Y/1" Y/1.5" Y/2" Y/3"
'96-'02 Toyota 4Runner - 3rd gen Y/1" Y/1.5" Y/2" Y/3"
The 1" lift rack&pinion extension (pictured right in image "C" above) is priced at $30.00 for use with existing body lifts. Extensions for 1.5", 2" and 3" lifts are available for use on existing body lifts as well. On Tacoma 4WD pickups with 4" ProComp lifts, steering extension beyond 5/8" tall may not clear the steering rack drop bracket. Extensions over ~2.5" tall will not fit un-lifted rack&pinion vehicles due to rag joint / frame interference, but this is tall enough for a 3" body lift, due to the angle of the steering shaft. These extensions can also be combined with upper spline extensions used in other lift kits, such as what PA supplies, or it can be used to replace the problematic and breakage-prone spline extensions. Also note that on Tacoma Pickups with Edelbrock headers, you may be restricted to about a 1" tall spacer, due to header/rag joint clearance issues. 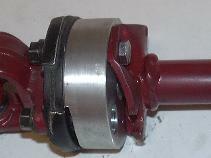 For recirculating ball steering (pictured left in image "C" above), generally the steering shaft is extendable (and collapsible for crash safety). But if you can't extend the shaft, a similar bolt-in rag joint spacer is available. Since the steering shaft is at an angle, you usually only need extensions over 2" of lift and then only at 1/2 the amount of lift. For example a 1" spacer (3/4" actual height) should be enough for a 2"-3"lift or when moving the steering box forward, as with a Solid Axle Swap (SAS). 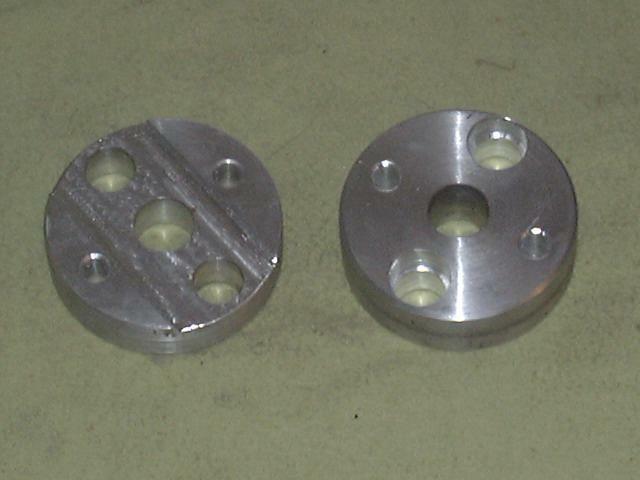 Due to the extra machining for this type of rag joint, the 1" spacer runs $40.00 for use on existing body lifts, or $35.00 when purchased as part of a 4Crawler body lift kit. 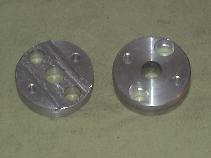 This type of spacer can be used on 2"-3" lifted Toyota 4x4 pickups and 4Runners from 1995 and earlier and T-100 pickups. Note that it is not required as it is usually easy to extend the stock steering shaft. Also, be sure to specify whether you need the rag joint clearance slot/pockets (see picture "C") in line with the large or the small holes (slots in line with the large holes is typical). Note that the extension may have either two pockets or one slot machined for clearance, either one will work fine. The large holes fit over the studs in the rag joint, the small holes are for the bolts that hold it together. The slots provide clearance for the tabs the encase the rag joint rubber and allow the spacer to sit flush to the rag joint. The 2" spacer (1-3/4" actual height) can be used for applications where the stock steering box has been relocated farther forward on the frame or where the existing steering shaft is not long enough with the 1" spacer, an example application shown in this link. Also available a 1.5" (1.25" actual height) spacer for those in-between situations. A steering shaft extension is also available for the 4th generation Toyota 4Runner, FJ Cruiser and some 2005+ Tacoma models with bolted rag joint steering shafts (and it is such a good design that other lift kit manufacturers. have stolen our design for use in their own kits!). On the later model Tacoma pickups (2005 and later), some steering rag joints are bolts and some are riveted or have pressed in studs. If you have a riveted rag joint, you'll need to be able to remove that steering shaft in order to drill or press out the rivets/studs before you can install the steering shaft spacer and also order a special version of the spacer what is drilled out larger in the center to clear the riveted rag joint - the special version adds $15.00/spacer to the cost of those below. Contact us for details. So be sure you ascertain what setup you have prior to ordering. Postage and applicable sales tax is added automatically with the ordering buttons above for Priority Mail delivery, please be sure to provide a VALID mailing address and international orders, provide a local telephone number for customs paperwork. Both type of extensions come with mounting hardware to install on your steering shaft. T. Contact 4Crawler Offroad if interested in purchasing a separate steering extension for your body lift kit, or order above. See the installation instructions for more information. A shipping charge is added automatically with the ordering buttons above for Priority Mail, please be sure to provide a VALID mailing address and international orders, provide a local telephone number for customs paperwork. If you do not see your bumper application listed above, feel free to contact 4Crawler Offroad to see about availability. For a new bracket to be designed, you'll be required to furnish pertinent dimensions of your existing brackets, such as bolt hole size and spacing. And feel free to consult the installation instructions to see how the brackets are installed and also see the section on modifying aftermarket bumper brackets for use with body lifts. The radiator may need to be relocated with a body lift. This is often the case since the radiator mounts to the body and the engine (and cooling fan) are attached to the frame. Lifting the body offsets the two leading to possible fan/shroud interference or reduced cooling efficiency if the fan moves outside the shroud. There are a few cases where nothing needs to be done with the radiator mounting. One case is where you have an electric fan attached to the radiator itself and as long as that setup is clear to move up with the body, no relocation may be needed. This will also depend on how the radiator hoses can handle the offset. In some cases, you may find at lifts of 2" or higher, the radiator hoses may become kinked and that might restrict coolant flow. So be sure to inspect both the upper and lower radiator hoses to see how they will respond to the offset caused by a body lift. Another case where the radiator may not need to be relocated is where there is "daylight" between the fan and shroud (or where the fan shroud has been removed). In this case, the radiator can be raised without causing interference with the fan, so as long as the hoses are "happy", no relocation is needed. And a variation of this case is where the lower half of the fan shroud is removable (or has been removed), then the fan has clearance below the shroud and the body lift will cause no interference. That said, there are some advantages to relocating the radiator back in line with the engine mounted fan, assuming that fan has not been replaced with an electric fan. That is that the fan and shroud are an important part of the cooling system, especially when stopped or when driving at slow speeds, like when going off-road. The shroud and fan work together to maximize air flow through the radiator when the fan is the only source of air flow (note that when driving at speeds of 20MPH or more, the natural air flow from the vehicle's motion is usually sufficient to cool the engine). But we have seen some studies some time ago in one of the off-roading magazines where they tested all sorts of radiator/fan/shroud setups for cooling efficiency and the variation was only in the 5% range from no shroud to a properly fitting shroud. But, if you live in a hot climate and tow a boat up into the mountains with the A/C running, you may need every percent of cooling efficiency you can get. While if you live in a cooler climate, it may make no difference. Like we tell folks, there are no "radiator police" out there that will pull you over to measure your radiator height and write you up if it is not perfect. The drop brackets pictured below may be used on most vehicles that use 4 screws to hold the radiator in place on the front core support. The upper set of brackets feature a 5/16" threaded stud and 3/8" holes spaced at 1" intervals (on the 2" and taller brackets) to allow the radiator to be lowered to match the body lift height. The lower set of brackets are used for certain applications where screws go through the core support into threaded holes in the radiator flange, such as on the Toyota Tacoma and 3rd/4th gen 4Runners. They are identical to the upper brackets, but the kit includes 4 - M8x1.25 allen head screws to use to attach the brackets to the radiator and then the studs on the brackets go through the holes in the core support for mounting. 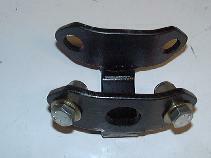 Standard bracket sets shown above, also availabe are 1.25" and 1.5". The deluxe kits include 4 M8 button head screws for later model Toyota vehicles like the Tacoma pickup, 3rd, 4th and 5th generation 4Runner and FJ Cruiser models. These screws allow the brackets to be mounted to the threded holes in the radiator flange and then the stud on the bracket can be inserted into the hole in the core support. Size: Select size: 1 in. 1.25 in. 1.5 in. 2 in. 2.5 in. 3 in. A shipping charge is added automatically with the ordering buttons above for Priority Mail (within the US) or Priority Mail International (outside the US), please be sure to provide a VALID mailing address and international orders, provide a local telephone number for customs paperwork. Most everyone knows about aluminum, but Ultra-High Molecular Weight PolyEthylene (UHMW-PE) may be something unfamiliar. Polyethylene itself may be a familiar material, commonly used in milk jugs and other plastic packaging. This is typically a low molecular weight material. UHMW on the other hand is a polymer material with the toughness of a metal: composed of long polymer chains with a molecular weight of between 3 and 6 million. UHMW-PE combines the traditional abrasion resistance of metal alloys with the impact and corrosion resistance of synthetic materials. The resistance to abrasion, impact and corrosion of UHMW-PE exceeds that of many conventional structural materials. It has a number of other valuable characteristics in applications requiring superior wear resistance and sound deadening. Its self-lubricating properties eliminate the need for oil and greases, making it suitable for use in the food industry where contamination from lubricants would pose problems. High abrasion resistance makes it ideal for liners, enabling light aluminum trucks and trailers to carry sharp or abrasive loads. In the manufacture of separators for lead-acid batteries, UHMW-PE meets this demanding application due to its excellent corrosion resistance. This is tough stuff, drop one of the blocks and you'd swear it was metal. It is a bear to cut, it took 4Crawler Offroad quite a bit of research and development to find a way to cut the bulk rod into useable blocks. One last factor that makes UHMW-PE an ideal material for body lift blocks is that it is self-lubricating, i.e. it won't SQUEAK. With metal spacers or even the extruded fiberglass-type blocks, the constant rubbing action of the floor of the body and the blocks can lead to squeaking and on the fiberglass blocks, the friction can start to wear away the material. UHMW-PE is commonly used for bearing material in industrial applications. UHMW-PE has a wide temperature range as well, from below -100°F to +180°F and a melting point of over 280°F. Here is a link to more extensive physical properties of this material. 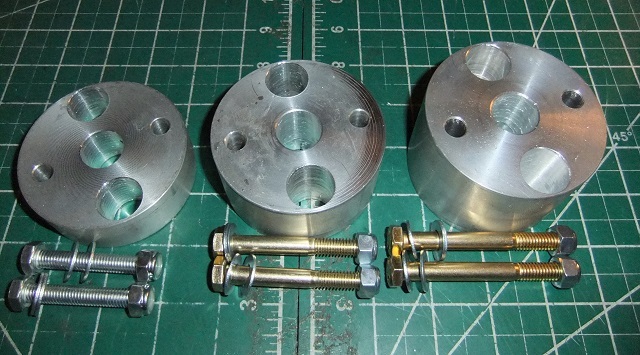 This kit will function for its intended use, that is it will lift the body of the vehicle off the frame by the specified amount, the bolts will fit in the blocks and the nuts will screw onto the threads of the bolts. Anything beyond that is totally out of our control. You must realize that this will raise your vehicle's center of gravity, making it less stable in turns and in off-camber situations. It can also increase leverage on body mounts, especially in cases of high speed impacts. This is simple physics and geometry. Although this kit is made from the highest quality materials possible, it is not a substitute for safe and careful driving. In other words; good, safe on-road and off-road common sense. Know the terrain, vehicle and speed limitations, and obstacles that lay ahead. Please remember to preserve our right to enjoy public lands through the proper use of your off-road vehicle, Tread Lightly by all means. After researching materials, equipment, and fabrication techniques, 4Crawler Offroad was formed to provide these products at a reasonable cost in order to be able to offer this solution to others who lacked the time, equipment, or expertise to do this themselves. 4Crawler Offroad does not have the resources to go test fit all the kits on every possible year and model truck. Kits have been installed on representative vehicles and it is felt that they will fit as designed. With variations in specific vehicles, etc. 4Crawler Offroad can't guarantee all the parts will fit perfectly on any given vehicle. We will be more than happy to work with you on resolving fitment issues as they come up. If something looks like it won't fit, please contact us and together we can work on resolving the issue. 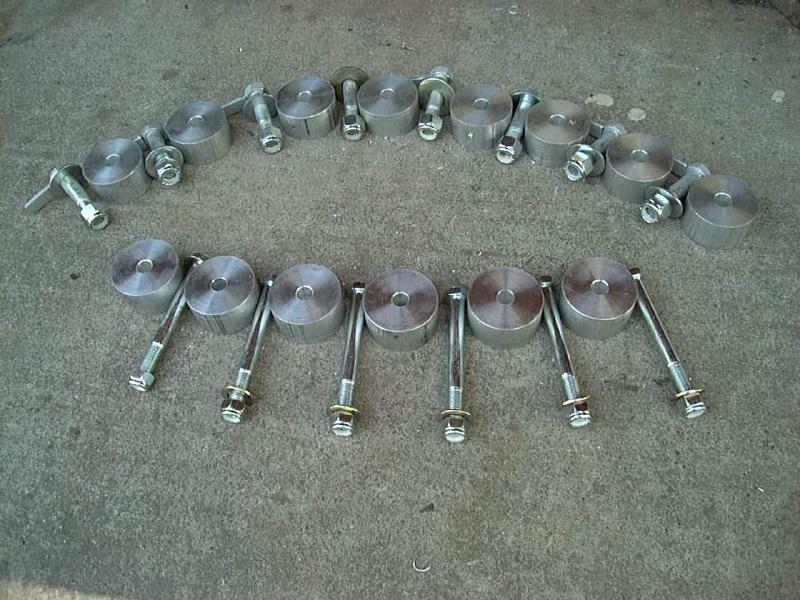 If you want to ensure a trouble-free installation, you are more than welcome to provide a list of stock bolt sizes/lengths and other pertinent information prior to placing your order. In the above photos, you can see my truck when it sat on the stock body mount bushings and 3 years later with a 3" body lift. I think there was more "stuff" hanging down below the body before than after. FYI: Both shots are taken with the same 33x9.50 tires. I do have nerf bars installed in the after shot that were not there in the before picture. I replaced the stock wheel well liners with Lift Lips designed to cover the gap for a 3" body lift. Both front and rear tires are capable of getting stuffed several inches into the wheel wells. At one time, I measured only 5" from the front fender to the top of the rim, meaning I had about 4" of tire above the lip of the fender. Folks will list many reasons why a body lift is a bad idea. Mostly those concerns seem to revolve around poor or incomplete installations. So just like the person who puts on larger tires and then complains of a "lack of power" in his truck. Well, this is just an incomplete installation, you really should change the axle gearing to restore the original engine RPM and torque range on the road. Or a person who installs a suspension lift then complains about drive shaft vibration or CV joint breakage. Again, this is a case of an incomplete installation. You need to address and correct any drive shaft angle/alignment issues and/or take steps to reduce CV joint operating angles to reasonable levels. So, if someone complains that a body lift messed up the shifter operation, this is another case of an incomplete installation. There are many solutions available to make shifter operation work as well, if not better than stock; including shifter extensions, short throw shift kits, drive train lifts, etc. Or they complain that there is a gap between the body and bumper. Simple fix is to install relocation brackets or modify the bumper to close the gap. And this has the side effect of increasing approach and/or departure angles on the vehicle, which is another aspect of a body lift many folks overlook when they say a body lift provides no increase in ground clearance. While it is true that the frame is not raised, if your front and/or rear bumpers hang down low, these can limit the size of obstacle you can get up on or off of, so there is more to "ground clearance" than the height of the frame or axle above the ground. Another concern many people have about body lifts is the gap between the body and frame, most visible in the wheel wells. I run a set of Lift Lips on my 4Runner. They replace the stock plastic wheel well liners with a heavy rubber material and cover up to a 3" lift. Here's how I installed them on my truck. Not only do they fill the unattractive gap but they also help keep water and mud out of the engine compartment. 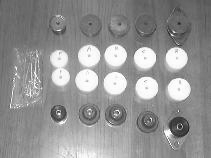 You can also obtain some material from a good hardware store and make your own. Use something like sheet rubber, pond liner, rubber roll roofing, sheet vinyl, etc. Remove the old wheel well liner and use it as a template for cutting the new liners. Draw a parallel line to the top, spaced down an amount equal to your lift. Then line the old liner up with the top of the sheet and trace the upper half. Then slide it down to the line you drew and trace the bottom half. Mark and punch out any mounting holes and you now have a copy of the liner that will cover the gap created by the body lift. Reattach it with the factory hardware. On vehicles where no liners exist from the factory, usually just a simple rectangular strip of material will suffice. Mark and drill some mounting holes and attach the liner to the lower lip of the wheel well. As an alternative 4Crawler Offroad can supply the wheel well liner raw material. We offer oil resistant neoprene rubber sheets in two thicknesses; both standard 1/16" (1.5mm) thickness and a heavy duty 1/8" (3mm) thickness. Each sheet, typically enough for 1 wheel well, is sized 12" tall x 36" long (305mm x 914mm), cost is $20.00/sheet in 1/16" thickness and $30.00/sheet in 1/8" thickness. We can also source a fiber reinforced neoprene rubber sheet that is $30.00/sheet in the 1/16" thickness. That mateial is more resistant to tearing compared to the plain rubber. Separate shipping as noted here. To include with a body lift kit order, contact us for total shipping cost. Depending on the kit ordered and the shipping destination, there may be additional shipping cost involved. 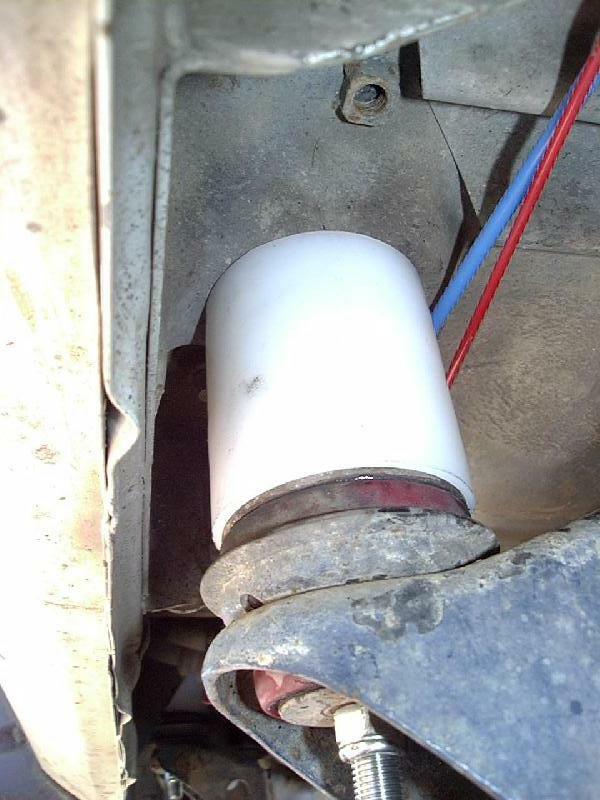 To make a custom fit wheel well liner, remove the existing wheel well liner from the vehicle. Lay the top of the liner flush to the top of the material and trace the upper half. Also, mark all the hole locations for the mounting hardware. Then mark a few places where the bottom of the liner sits and then measure down an amount equal to the height of the body lift, for example 2", from those 2 points. Now slide the original wheel well liner down to those two new marks and trace the bottom half of the existing wheel well liner. Now use a pair of scissors to trim the top and bottom of the material to the lines you traced and punch holes for attaching the liner to the wheel wells. When making cuts, be sure to leave no sharp inside corners. Instead, try to leave about a 1" radius on all the corners to prevent tearing once the material is installed. 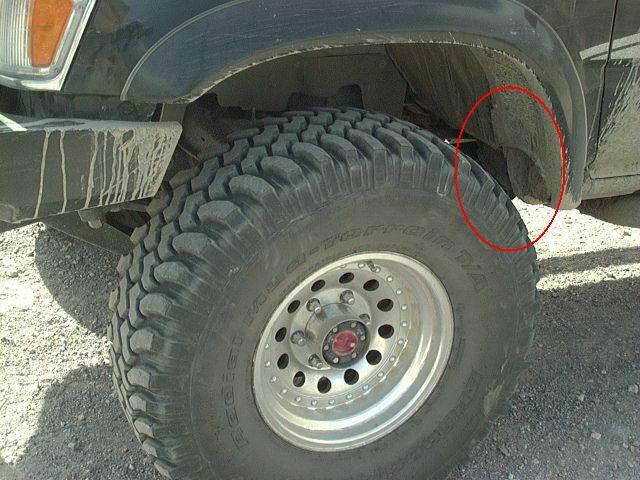 Note, on some vehicles, you may be able to cut two liners from one sheet, for example the rear wheel wells on a pickup or 4Runner as those liners are often just a straight piece. If in doubt on the address, (or you want to use a different address) please include the address you want to use in the "NOTE TO SELLER" field when given the option above. Company name will show up as "Visual Diagnostics/4Crawler Offroad"
Feel free to e-mail 4Crawler Offroad to let us know you issued the payment, although we automatically get an e-mail notification to this effect. You should receive a confirmation e-mail from Paypal if the transaction was successful. If you don't have a Paypal account, its easy to set one up using the link above, enter your name/address/e-mail and account info.